Tracking the progressive advance of Ebola virus in West Africa in an animated HealthMap projection created an eery sense of inevitability of the virus’ unprecedentedly rapid diffusion. 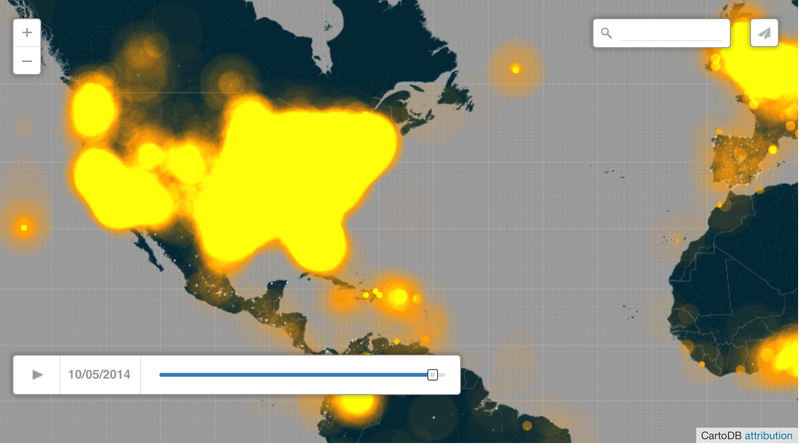 But the mapping on a Google Maps platform so removes the virulent spread of the virus from any context, noting suspected and confirmed infections and fatalities in a bubble map, to poorly embody the scale and scope of its threat of its contagion. Omitting the distinct terrain over which the strain has expanded from rural areas to urban slums, and the complex vectors of the new strain’s transmission almost conceal the reasons why this outbreak has been so hard to contain adequately, and leave one raising perhaps unanswerable questions about the delay of an orchestrated or more effective response to contain or try to control its now-exponential spread. 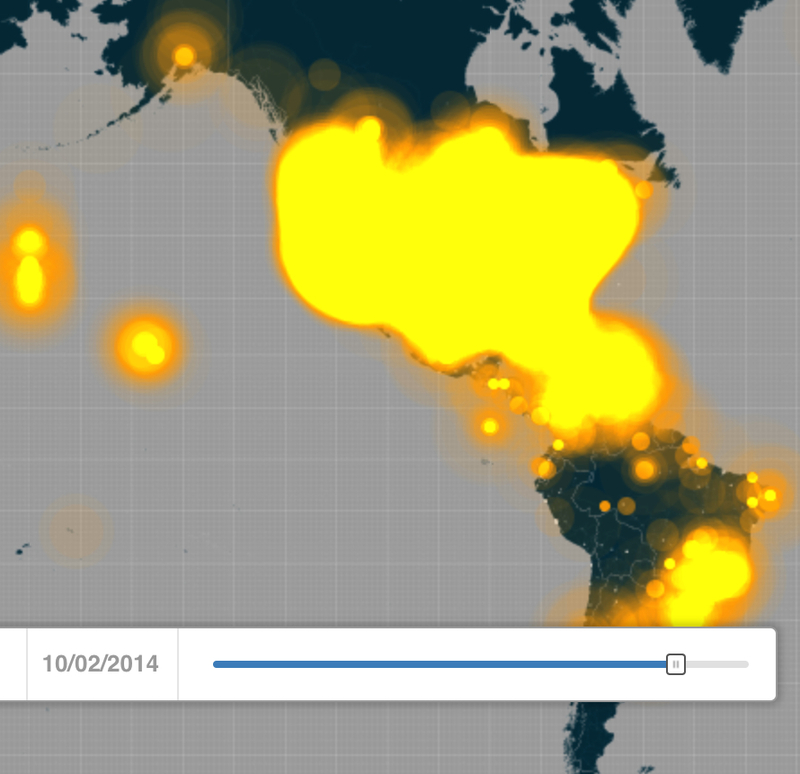 The rapidity with which microbes from the very rainforest allows the virus spread to highly vulnerable populations of Guinea, Liberia and Sierra Leone, as well as, recently, both Nigeria and Senegal–populations particularly vulnerable to the current strain–foregrounded in a time-lapse sequence of those infected with the deadly virus uses a Google Maps platform and template to map the spread, but might be taken as something of a challenge to better map the virus by refining our image of the virus’ transmission and catastrophic spread. If such widely circulated maps provide a basis for describing the challenge of containing the virus’ spread, they also present a challenge for better mapping the transmission of Ebola virus and reviewing reasons for slow response, perhaps as we hoped the contagion would not emerge to be so virulent as it has become. Were we confident in the containment of the disease, or were we not mapping the multiplication of pathways of its transmission? What sort of maps can we now make to better understand the specific distribution of the disease? Did our own reliance and use of apparently exacting maps, which were only as good as the data that they were fed, conceal a delay in broadcasting early warning signs to the world? If this is the case, it makes sense to ask if an unwarranted trust in the metrics of mapping has contributed to a lack of clear understanding or reporting on how the disease has spread. The outbreak that has outpaced previous outbreaks of the virus in central Africa challenge our models for mapping Ebola the spread of the deadly virus–whose mortality rate has at times been estimated as high as 90%. Even notwithstanding the low resistance of the populations of West Africa, and its location in a region of recent urbanization–unlike the rural areas of Central Africa where outbreaks had been previously confined–the unprecedented levels of human-to-human transmission challenge us to map the contagion we seek to control in ways that can best process the very rapid transmission of the virus and its advance across six countries with varying rapidity. The numbers noting rate of mortality in the above map threatens to overwhelm our sense about the virus’s spread by privileging the rapidity of its contagion and not examining causes for its diffusion or vectors of its virulence. 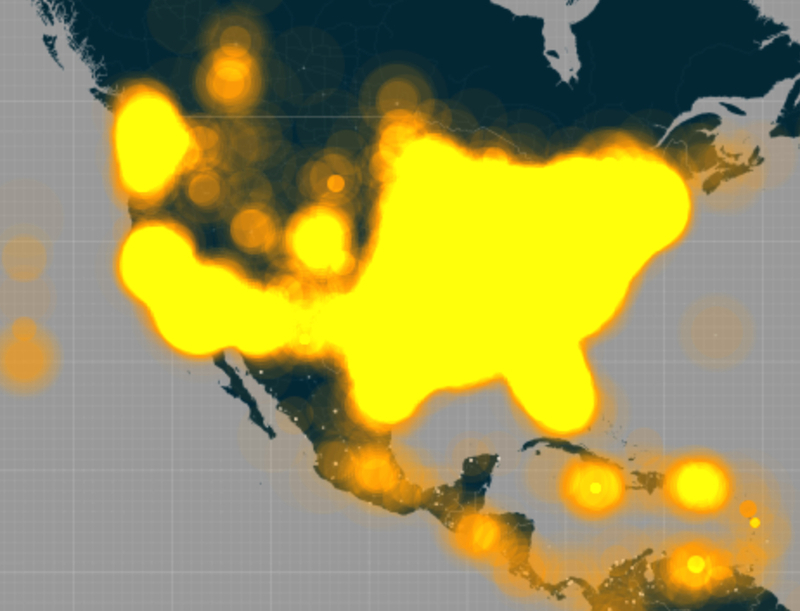 The HealthMap announcements have become the recognizable image of its spread. But despite the apparent authoritative HealthMap graphics as mapping the disease’s first appearance on March 19, a full “nine days before the World Health Organization formally announced the epidemic,” notwithstanding the considerably large investment in Health Map of the US government’s Intelligence Advanced Research Projects Activity (IARPA), rather than standing at the forefront of health reporting and surveillance, the first maps HealthMap issued in fact antedate the first news conference of the Guinea’s Department of Health of the Ebola outbreak, reported in the first news articles on a “hemorrhagic fever” which summarized the news conference of the Director of Disease Prevention, Dr. Sakoba Keita. 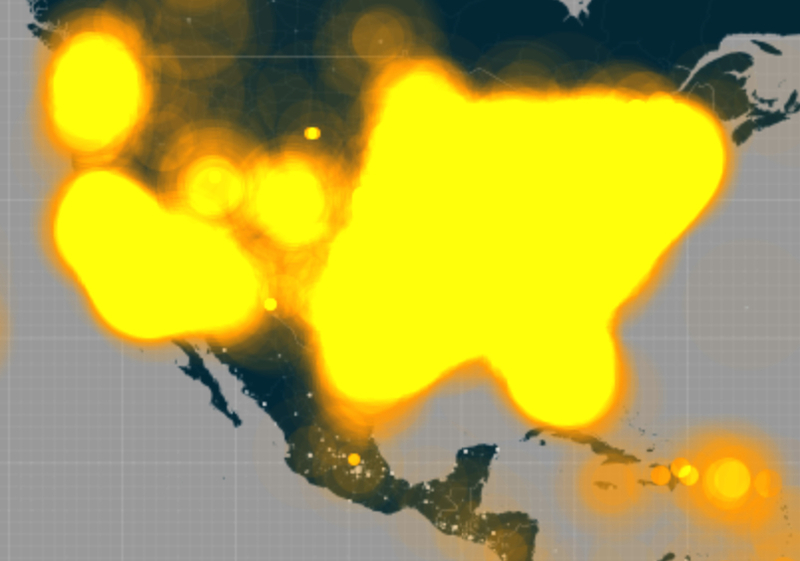 While we have focussed on the HealthMap graphics for the authoritative clarity with which they mapped the virulent disease’s outbreak, forecasting systems played little role in detecting the virus–and little advanced news of the outbreak beyond traditional news sources. The rhetoric of the map has masked the lag that occurred in the first diffusion of news reports of the hemorrhagic disease. 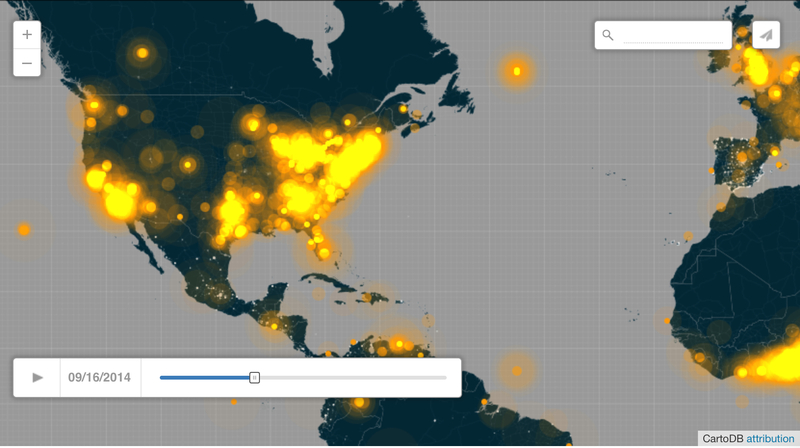 The unfolding of the maps of the disease’s spread display a similar reluctance to listen or observe on the ground, but rather to synthesize data in what has become something like a proxy for direct observation or reporting. The limited spatial context for the generic Google Maps platform used on HealthMap especially obscures, on account of its lack of spatial precision, the complexity of new vectors and sources of transmission that differentiate this outbreak from Ebola outbreaks in the Democratic Republic of Congo over the past fourteen years. For it maps the disease only by registering numbers in vague national conglomerates–often using incomplete numbers reported by local agencies. While the first cases appear to the Guinean forest, the spread infection to urban areas and slums offers a powerful chart of the outbreak that–unlike earlier outbreaks of Ebola in central Africa–gained a virulence that challenged both public health authorities and residents who had little exposure to the animal-born disease. 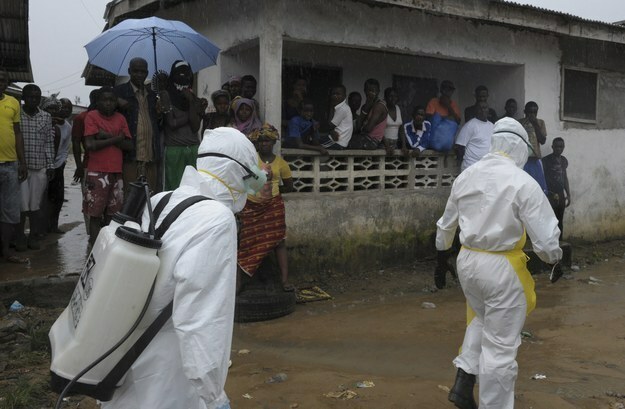 The crowding of states with tan and brown bubbles to designate human suspected or confirmed infections obscure the dynamics and dangers of Ebola’s transmission to a rapidly urbanizing landscape, and are silent on the dangers of confronting the wide range of potential pathways of its transmission that we seek–and indeed are ethically obliged–to contain. Maps provide forms for embodying as well as tracking diseases, practices of mapping can both communicate the exponential expansion of fatalities of infected victims across space, and suggest potential future strategies for their containment. Were we only hoping that, as earlier outbreaks in the Central African Republic or DRC, the West African outbreak would be contained, without considering the multiplication of vectors by for its contagion, or the new terrain and new populations to which it had spread? Or did we fail to map its dangers as quickly as we could have done? 1. The lack of qualitative or specific details in these maps treat them as registers of the exponential expansion of epidemiological updates. Whereas no previous outbreak of a strain of the diseases has produced more than several hundred cases, the virulence of the specific strain of Ebola, previous confined to rural areas, may rest in the multiple vectors of its transmission and the difficulty containing new vectors for the transmission of Ebola, easily communicated through contact with bodily fluids or blood, leading to a far greater expansion of human-to-human transmission of the disease than occurred in recent history. 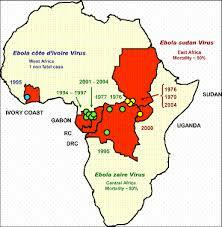 Shock at its spread displaces the vectors of contagion by which Ebola has so rapidly and virulently spread. Indeed, the current reproductive rate of the disease suggests its expansion will continue most dramatically. When epidemiologist Michael T. Osterholm warns “the Ebola epidemic in West Africa has the potential to alter history as much as any plague has ever done,” the comparison may illustrate both its extreme danger and potential significance, and a need to reconsider how we have charted the contagion’s spread. Plague was, of course, misunderstood as a miasma and not examined as being transmitted from the bacteria carried on fleas resident in rats. While we don’t still know the natural reservoir of the virus, or the relations between different strains of Ebola virus, the pathways of its contagion challenge our ability to map the vectors of viral transmission–and the mapping tools we might better use to contextualize its virulent spread from its epicenter in the Guinean forests. Despite repeated warnings of the dangers that the consumption of infected carcasses as bush meat constituted a neglected source of its transmission, the expansion of human-to-human transmission has obscured its animal-born origins. The continued possibilities for infection from the meat of carcasses of animals infected with the virus moreover creates new problems as the WHO works to contain the spread of microbes dwelling in the very rainforest that spread to vulnerable populations in Guinea to recur in Liberia and Sierra Leone, as well as Senegal and Nigeria–whose populations seem particularly vulnerable to the current strain. The first documented documented cross-border spread of the disease, according to tropical medicine specialist Dr. Estrella Lasry, occurred in late March–about the time that the outbreak was first reported by Guinean authorities to the WHO. In over just a month, by April 20, the distribution of suspected cases had dramatically grown, in ways that would have already suggested the substantial threat of its growing incidence of what had been confined to inland areas, and had not been associated with the region: the migration of the disease from forested and rural areas to cities marked the first time urban occurrence of hemorrhagic fevers in urban slums, in crowded areas where it dramatically spread, overwhelming health care workers whom it affected in great numbers, and the fear of its international spread prompted military-enforced cordon sanitaire at border areas, as more affluent areas trusted in their access to superior health care protected them from the growing diffusion of the infectious disease even as it spread. The concentration of infections seem relatively concentrated, but had taken on particular virulence on in Liberia–a country with limited health care facilities or health-care workers. And by July 8, the area of those infected by disease had grown broader and deeper in density, and any hopes that the outbreak would stay in a concentrated area disappeared, although international attention was only gained as the virus arrived in Nigeria in later that month. Providing a means of grasping the spread of a disease and the dangers that it poses is an inherent property of the map, but the obstinacy of not reading the disease’s widespread infection is difficult to explain fully. Could it be that the multiplication of the vectors for the disease’s transmission were inadequately mapped? Yet plotting confirmed incidence of Ebola tells only part of the story of the expanding risks of infection in the sub-Saharan continent, and the silences of the HealthMap graphic compromise its informative value. Recent predictions that the spread of infection by Ebola across West Africa will continue for twelve to eighteen months have confirm, if this was needed, the global scope of the health disaster, as the cascading influence of the spreading contagion for which we have no vaccine challenge the region’s food security. The expected spread of Ebola virus in new areas will continue to raise compelling questions of the ethics of care–and of the availability of provisional vaccines that will be developed as they are tested–as more than 70,000 people in much of sub-Saharan Africa seem to lie at risk–according to the fifty-two received alerts for Ebola in just a week in mid-September. How did it travel so quickly after being apparently contained so long? How safe can it even be to remain, at this time, in Liberia, or to send medical doctors and workers, needed nurses, and temporary hospitals there? This post focusses attention on the ethics of how we have mapped the virulent disease both at a remove from the landscape and surroundings where it has occurred, and the sense it makes to continue to tabulate confirmed or suspected cases of infection. For we have charted the current spread of Ebola virus spread to at risk populations, suppressing panic at its exponentially expanding scope, as we try to imagine how the infections might be contained by charting the number of humans infected, omitting the virus’ relation to vectors of transmission or hosts that may warp the dangers faced by people who might become infected in coming months. 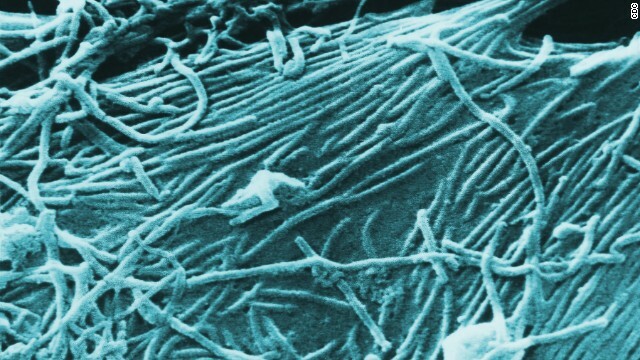 Although there is the danger that the current strain may mutate to an air-born virus, as some fear, tracking its human-to-human transmission might be placed into better relief by considering both the paths by which the virus migrated into urban areas and jumped to humans from animal hosts. A chief difficulty of continuing to map Ebola against a base map of national frontiers and boundaries is that it contains the virus lies in locating it within fixed boundaries and perimeters–and misleadingly suggest a controlled outbreak. Maps of the region foreground numbers of dead and infected along a blank topography, moreover, in ways that conceal the potential for a qualitatively rich map of the virus’ spread from the Guinean forests, where the recurrence of the highly contagious disease first broke out in humans. Such projections of the virus ignore important questions of how the vectors or courses of transmission the outbreak have made it so difficult to contain: for we often read the maps for the possibility for human-to-human contagion, although the spread of the virus seems to mirror the possibility of several sources of Ebola’s transmission to humans from its animal hosts. 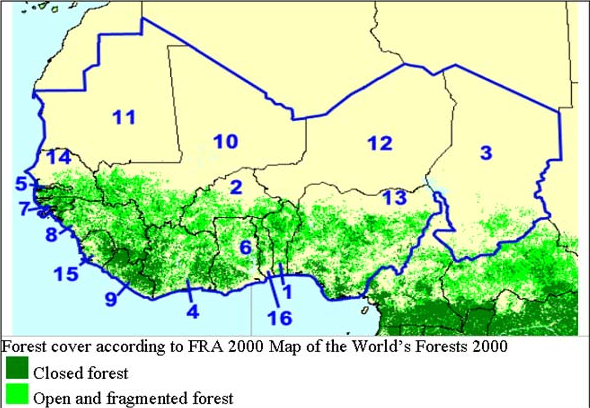 Indeed, the spread of the virus mirrors the fragility of the broadleaf forests that run from Guinea to Sierra Leone in the West and the Cote d’Ivoire, Liberia, Nigeria and Togo to the East, mapped below–an ecosystem that is an environmental “hot-spot” whose diversity is so endangered by slash-and-burn agriculture and irresponsible mining to be among the most “critically fragmented regions” in the world. The terrain reflects the contours of regions in which Ebola has spread from the very bats and primates from whom we believe the highly contagious strains of Ebola jumped. We neglect at our peril possibilities of recurrent transmission from animal hosts as we seek to map the spread of contagion at a remove from the continued consumption of such animal host as “bush meats.” The widespread contacts with meats of monkeys, rat, and bats–all affected by the virus–from the fragmented forest may have contributed to its spread to more heavily populated regions where we are now struggling to contain its transmission. The coincidence of these regions suggests the need to map distributions of animal inhabitants as we chart Ebola’s dramatic spread across areas it rarely occurred previously–beyond the transmission of the virus by human hosts. The spread of the disease has occurred without proper precautions or an establishment of best medical practices. The worst Ebola outbreak ever confronted by doctors and medical staff was regularly met without necessary protective gear in many West African hospitals for much of the summer. As if in a terrifying apotheosis of Ivan Illich’s argument of the abundance of “iatrogenic” diseases whose transmission grows in hospital settings, we face descriptions of the frequency with which hospital beds and rooms covered with smeared feces, urine, or blood–the very prime vectors for contracting the virus–were the norm. The inadequacy of facilities to control or treat the highly infectious disease’s spread has been facilitated not only by health-care breakdowns but an inadequate understanding or mapping of its epidemiological causes, masked in the above graphic, leading President Obama to propose the contribution of multiple mobile hospitals in order to bolster local health-care. 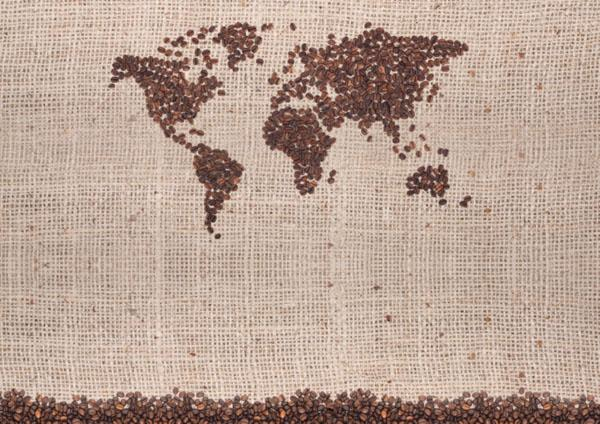 As we brace for waves of panic, challenges to food security with a far more limited harvest, and rising food prices, map-makers will be challenged to chart the waves of multiple impact of the simple virus across the continent. Have we understood the best models for mapping a disease that has been imagined as specific to humans, but which has not only infected as it has jumped to humans from the animal population, but seems to have jumped from rain forest populations of fruit bats, antelope, great apes, and chimpanzees through local food supplies? Although once the virus has migrated to humans, further pathways of infection will be human-borne, the continued danger of Ebola’s spread through meats and contact with animals’ blood suggest a proliferation of the virus’ impact we need to assess in order to contain most effectively. Controlling the transmission of the virus’ transmission, which can occur through contact with the effusion of blood or bodily fluids from infected bodies, or spread from contact with cadavers, is now feared to spread to up to fifteen nations–of which some 22 million people stand to be at risk. The maps of the risk of the infection have, indeed, displaced maps of actual infections or local mortality rates as the focus of international news–as what was at first a West African phenomenon has been replaced by a startling “heat map” of the broader populations at risk for virulent disease, whose infection of which is shown as spreading like an unstoppable cancer across Central Africa toward the Democratic Republic of the Congo and Burundi. The eye-catching graphic in the Daily Mirror used data of at-risk populations across Africa to create a graphic of the disease boring a radioactive hole in the continent’s interior. 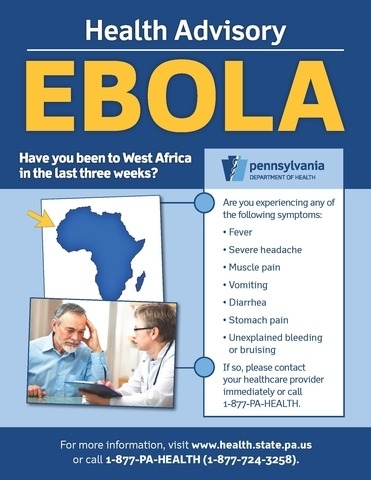 But the numerous absences and silences in this attention-getting infographic–as the Google projections of confirmed cases and deaths from Ebola in this post’s header–distort its communication by the remove at which they lie from the local landscape. Is this eye-grabbing graphic most informative guide to the progress of the devastating disease, if it tracks the range or human infection by Ebola alone? And could one better understand the multiple “populations at risk” that it illuminates, not only in Guinea, Sierra Leone, Liberia and the Ivory Coast, but Togo, Angola, Uganda, Cameroon, the CAR, DRC, and Burundi by the migration of the virus and the local transmission of viral infection? Would this offer a better base map to chart the containment of successive waves of infection? How would this change our notion of the best practices for the effective containment of the disease? 2. The World Health Organization hoped last month to control the outbreak of Ebola over nine months to only 20,000 human infections. But difficulties of controlling numerous vectors of the transmission of the disease through contact with bodily fluids now suggests the reality of soon facing 20,000 cases in one month that will be increasingly difficult to contain. Ebola’s spread raises questions of the best practices of mapping the devastating outbreak, and of communicating Ebola virus’s transmission: so physically devastating and gruesome is the virus, which is notoriously difficult to contain with success, or even to treat by intravenous replenishment, that viewing the virus outside the lens of human-to-human transmission is difficult. But the huge risks of transmission compels we consider what criteria to adopt to map to best process the disease’s spread and contagion. National maps of the distribution of illness make little sense in communicating that spread. The rapidity with which microbes focussed in the very rainforest that seem to have spread to vulnerable populations in Guinea to recur in Liberia and Sierra Leone, as well as Senegal–whose populations seem particularly vulnerable to the current strain. The outbreak at first concentrated in these three countries was no doubt encouraged by their increasingly urbanized and interconnected populations, especially among the high levels of poor who live in dense slums, whose populations who depend on the foraging of “bush meats”–the term for local animals in surrounding rain forests on which many depends. Such animals not only seem the hosts from which Ebola “jumped” to humans, but have themselves, due to deforestation, suffered from shrinking forest land, moreover, in ways that have restricted their regional habitat (and that of the virus)–augmenting the risk of a “spillover” of Ebola across species in these regions that it is deeply unethical not to map. The silences of the info graphic conceals deep changes, including the expansion of a network of roads that have multiplied routes of contact of meats from rural areas to urban slums, that have shifted the ecosystem of the Ebola virus itself. As we consider turning our attention to mapping the location of the virus and its varied hosts, we stand to gain much from what might be called a “deep map” of Ebola both less widely discussed and understood, for all the emphasis on the dangers of eating bush meats, and better communicate what underlies the disease’s dramatic distribution. 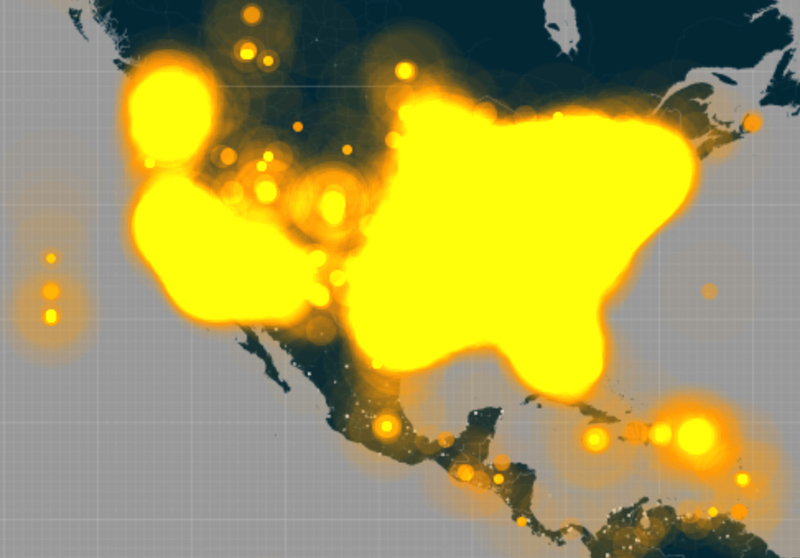 Absences of endangered forests are by no means the only silences of info graphics depicting the virus’s spread. The most prevalent way of mapping Ebola’s incidence by national boundaries and human habitation presents a striking contrast with the extent to which its hosts have been bats and other animals as rats and monkeys–whose consumed flesh is known as “bush meats.” The meats constitute a prevalent form of nutrition among poor in a region without traditions of husbandry. As much as the virus might be easily contracted by person-to-person contact, we may have focussed on contact of infected bodies, given both the horrors of hemorrhaging and bleeding in an uncontrolled manner so horrible watch and humiliating to experience, and our belief in familiar microbial transmission of influenza or other microbial diseases. This concentration on hand-to-hand contact may however have perhaps led us to focus on the bodily fluids of the infected as a vector of the transmission of the disease. Although such meats are now publicly prohibited from consumption by several governments, animals such as bats seem frequent hosts of the virus, although few mappings of the incidence of bat colonies have been attempted to determine the possibilities or potential for the virus’ geographical spread. Could one map not only the presence of disease in populations of fruit bats, a common for of bush meat, and the routes of their harvesting and transport for sale to urban markets? Such a practice of mapping is recognized by Oxford researcher Nick Golding as necessary to offer “the first step towards understanding where outbreaks of the disease might occur in the future,” as well as help “prepare for future outbreaks and to deal with the current one we need to understand how human movements cause the disease to spread once it has entered the human population.” Indeed, while the disease is found in animals over a broad territory, the outbreaks of disease among these animals are rare, and the ability to detect infections in animals militate against the ease of such mapping, the ability to synthesize a variety of social and environmental factors where Ebola might be transmitted to people from host animals might be mapped in order to be correlated with the past occurrence of human infection from Ebola. 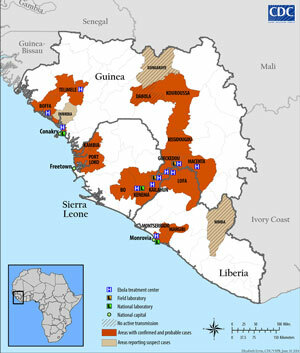 The mapping of such possible animal hosts of Ebola is not new or unavailable. But a mapping of the simple distributions of animals who serve as hosts for Ebola–from fruit bats to chimpanzees to cane rats–provides a basis to examine the entrance of Ebola virus into local food chains. To do so would present a compelling alternative mode to track spread of the virus from the first epicenter in Guinea to Liberia and Sierra Leone ,where it has been particularly virulent, and to Nigeria, and illuminate links that exist from the surrounding forests from urban centers on which health authorities have concentrated attention. To process the alarming spread of Ebola virus across West Africa, our use of maps to track the illness poses unique questions of how a virus judged to be hosted by animals (fruit bats or great apes or chimpanzees) in the continent’s interior has rapidly spread along its coastal populations as well as rural regions, that demand more advanced tools of mapping to track adequately. As we synthesize increased data about the precise location of Ebola’s initial outbreak, its pathways of infection, as well as its future risks, it makes sense to increasingly adopt such models to process the virus’ geographic distribution. 3. The recent closure of national borders follows the logic of quarantines for those infected with the virus, and reflecting the maps that specify nations whose citizens have been infected with the virus–rather than of controlling the vectors of its transmission. Might pathways of the handling and consumption of meats be mapped against the spread of Ebola, to create a more complex map of the virus’ diffusion as we work to contain its spread most effectively? 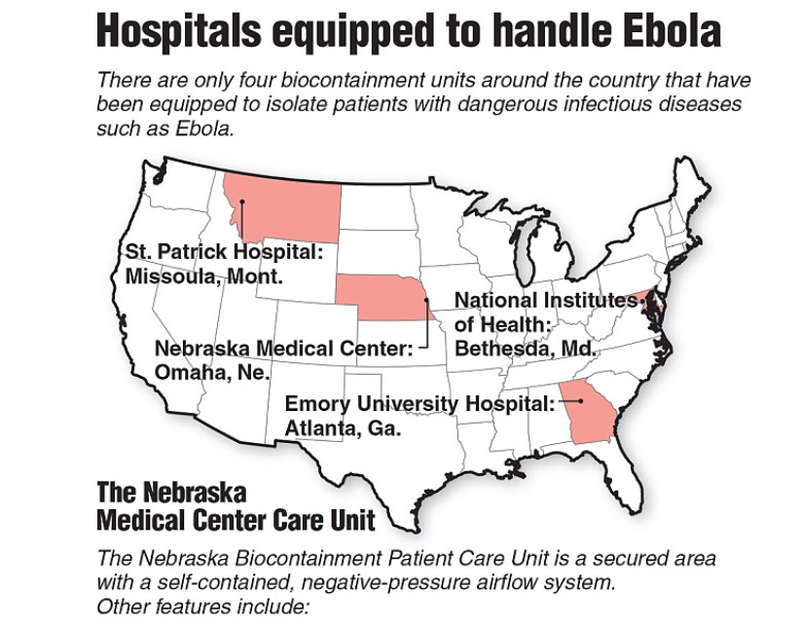 Examining other pathways for the transmission and contraction of Ebola might lead to a more effective attempts to contain its spread, to be sure, even as we focus on rates of suspected or confirmed infections that are reported by national agencies or available to the World Health Organization and CDC, and at least complicate the picture maps might offer of its containment. As it is, the progress of Ebola from rainforest environments is often labeled a “social problem” difficult to contain due to “deep-seated beliefs and cultural practices” as well as inadequate health care, and not mapped on the ground. 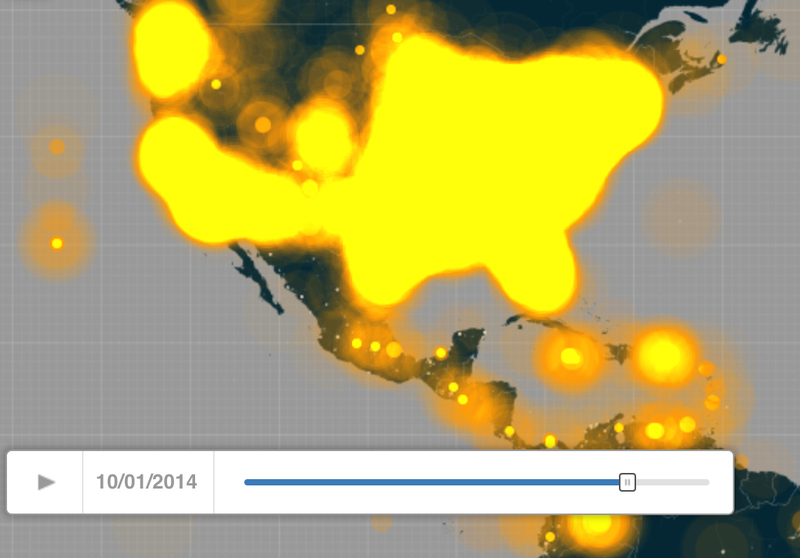 One stares at the progress of figures of mortality and infection in maps, questioning if they even display the full range of the infected, hoping to contain their future spread across the continent, without describing the range of narratives or social processes that have facilitated the contagious disease that they purportedly track. We have most often mapped the outbreaks and incidence of Ebola across West Africa by tallying infections and mortality in bubble maps that show sovereign frontiers, but might better map to trace the complex narratives by tracking so viciously contagious a virus against the changed landscapes where it has spread to understand the climates and environments in which it has appeared as we seek to contain the over 4,366 cases of infection so far confirmed. Despite valuable charts and tables that “map” the spread of Ebola virus across West Africa from March 2014, the tally of infections hardly begin to process the shock of the dramatic levels of mortality but both barely chart the striking process of the disease, at the same time as their alarmist tone effectively heightens our deepest fears of contagion. The recent proliferation of web-based maps chart the unfolding of the incidence of a virus previously successfully contained in remote areas in the African continent, but long feared to spread beyond its shores, as we picture terrifying screens for scenarios of a global health crisis caused by the tendril-like threads that seem to move from hosts with such ease as to complicate their vectors of transmission and confound the idea of what it would be to map the disease’s spread: as we come to conceive of Ebola as able to move from contact with an infected individual’s bodily fluids, mapping the spread of the virus seems the only way to grasp the meaning of its reappearance and difficulties of its containment. (The complication for West African food security as the virus has both increasingly claimed lives of rural populations and spread to the interior of the continent.) The microbe’s spread is poised to create a devastating web of indirect risks of global proportions, where risks of transmission have grown, despite a widespread ramping up of clinical trials by GlaxoSmithKline. By tracking the virus as if it were transmitted has spread only by human-to-human contact, and by excluding the transmission of the different strains of the virus from animals, we may be short-sighted in perpetuating only a part of the picture of Ebola’s rapid spread. Alternate scenarios for viral containment among local populations forecast situations where the possible numbers of individuals infected by rates Ebola virus could range from 20,000, if conditions stay roughly the same, to as high as 60,000 if conditions worsen–and, should conditions for treatment and containment improve, or a vaccine developed for humans, below 20,000. Although the geographic migration of the deadly disease is challenging to track, the maps we make of its incidence raise as many questions as they do red flags and suggest the importance of dedicating attention to Ebola’s spread. Such maps may erase the very vectors and hosts in ways that obstruct a clear understanding or picture of the terrifying process of the disease across the continent–as we risk essentializing the disease or seeing it as a consequence of inadequate health care. The drastic manner that the virus dissolves linings of the internal organs of the body by hemorrhaging and bleeding, perpetuate images designed doubtless to increase fears of the further spread of disease whose very symptoms–the discharge of blood and bodily fluids from bodily orifices, and, as blood fails to coagulate, something like the dissolution of linings of bodily organs–so horrific to experience so as to obscure other vectors for Ebola’s transmission. (Practices for treatment by intravenous replenishment of blood and electrolytes pin hopes on the reconstitution of one’s bodily fluids.) But the practice of mapping the disease’s incidence may tell only partial stories about the incidence of illness, and offer narratives inadequate to translate into health policies: for they ignore the danger of the transmission of Ebola in animal meat, and the migration of the disease from rural to urban environments. Has our fear of the transmission or communication of Ebola by contact with bodily fluids led us to focus, as in the case of SARS, only on the bodies of those afflicted with the disease? Ebola virus was almost only found in Africa since its discovery in 1976, fears of its migration off of the continent have almost subsumed understanding of the contradictions of its apparent localization in central Africa, where the first cases were discovered in Zaire and Sudan, contained on account of their remote locations, but with high fatality rates in all its strains. The absence of a vaccine or isolated antibody, the basis for much modern medicine, have increased deep fears about human-to-human communication of the viral disease, exploited in such films as Contagion and partly domesticated by the marketing of stuffed Ebola microbes. The paramount questions of its containment and isolation–the goal of the World Health Organization–and the difficulty of raises questions of how medical supplies, infection control, and treatments can be maintained, and the ethics of medical treatment without tested vaccines, as the geographical spread of the disease across two geographically removed regions faces problems of being contained–especially when its communication is not well understood or studied. The most recent panic provoked by the arrival of two infected Americans infected with Ebola virus in Atlanta’s Emory University hospital elicited immediate fears of the expansion of the virus and sympathy. Yet the logic of its spread may have been poorly mapped in relation to the environments where its progress has been most terrifying. The challenge of how to project the expanse of widespread waves of infection by Ebola virus across much of West Africa are hardly met by a static map of the region in which it has spread–which treats the environment as a passive field against which the viral infection has spread. As of August 31, the WHO reported over 3,600 confirmed, probable, or suspected cases of Ebola virus in West Africa,–and the number of people affected by the haemorrhagic disease has indeed recently exponentially grown, as reported cases have multiplied by over 50%. 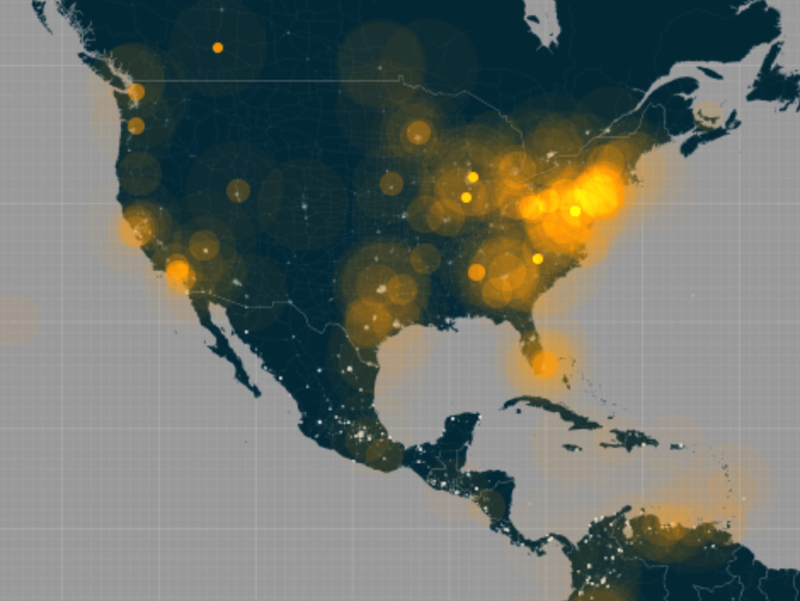 Could a mapping of the sites of outbreak and transmission of the virus offer a way of telling a story about the physically ravaging and highly contagious virus, or even process the sheer information overload of so many infected or deceased? Mapping the virus’ rapid and terrifying spread, as much charting its incidence from Guinea to Senegal, and beyond Nigeria, through their populations to Sierra Leone or Nigeria since its first appearance risks projecting fears of the danger of communicating the virus to populations worldwide that remove it from any cause, and limit our response. This post seeks to raise several questions about what shown in the organization of information in these data maps–and if one is not just tallying demographics not readily updated and lacking clear geographic specificity–and how to map the local outbreak as a global health risk. As we continue to process further information about the vectors of infection and the needs to contain infection among animals as well as humans, we can hope for more effective mapping of the incidence of Ebola, both in relation to urban centers, slums, and rural areas, as well as to areas of forests from which bush meats come. 4. The problem of charting local emergencies has become one of mapping a health crisis of truly global proportions. Even if it is now confined to a region in equatorial Africa, mapping the communication of the virus raises question of what it means to track the outbreak of Ebola, its relation to previous outbreaks, and the incubation of the disease that allowed its rapid spread. The relative lack of epidemiological sophistication by which maps tally reported cases of infection or mortality in bubbles fails to capture how the very geography that facilitated the contagious’ virus rapid spread by treating the base map of the virus’ communication as an oddly static field, and viewing humans either as potential vectors of infection or passive victims. For most of the maps of Ebola’s rapid spread seem to confirm the scariest fears of “losing the battle to contain” the virus for which there is no known vaccine, and which has previously ravaged the African continent. 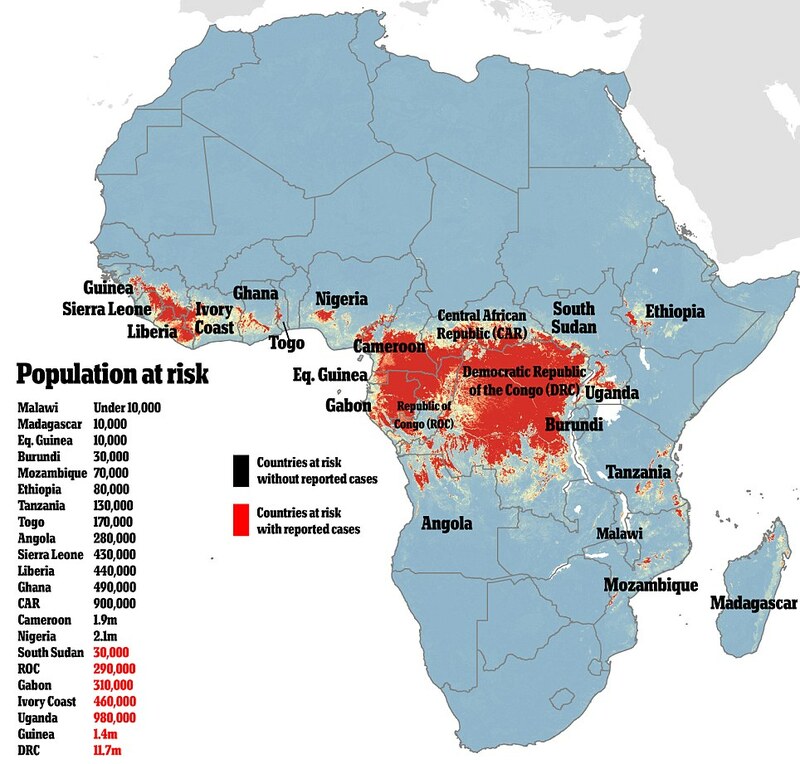 Geographic containment of the disease is a priority of the World Health Organization, the data maps of its spread in West Africa have offered a screen on which to project fears and concerns of outpacing efforts to control a disease whose spread through bodily fluids of people or animals–and the possibly placing the virus into broader circulation among humans once again. 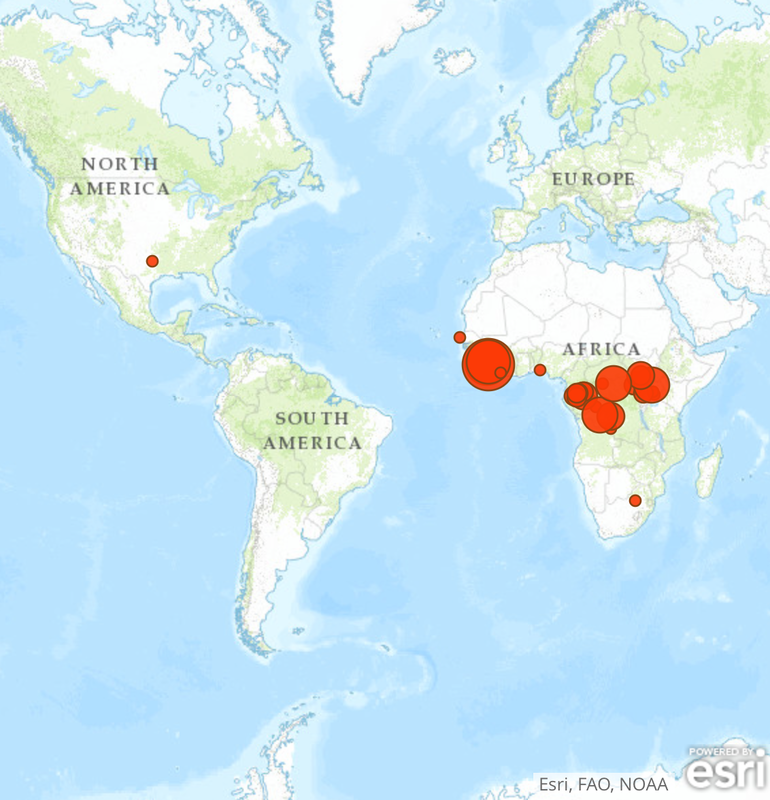 This highly infectious variant of previous Ebola outbreaks in the continent appears to have been likely underreported since the possible earliest case last December. While known vectors of its communication are poised to multiply, the practice of containment is impossible to achieve by quarantine and isolation of patients in sick-houses or containment of traffic between national borders: while the sealing of national borders in hopes to create barriers that might prevent the cross-country mobility among the possibly infected stands at odds with recent rapid expanding urbanization and geographic mobility in growing cities of this very region: demographic changes brought by increasing urbanization, deforestation and geographical mobility have transformed West Africa’s living geography in the past decade, effectively bringing the city closer to forests where the epicenters of past Ebola outbreaks. Yet the specter of confined borders or the creation of confines stands to create undue stress on relations between doctors and local populations to slow the infection’s spread or arrival of medical staff and supplies, if not generate panic and mutual distrust within local populations at the same time as weekly count of infected exceed 500, with many likely to be unreported. 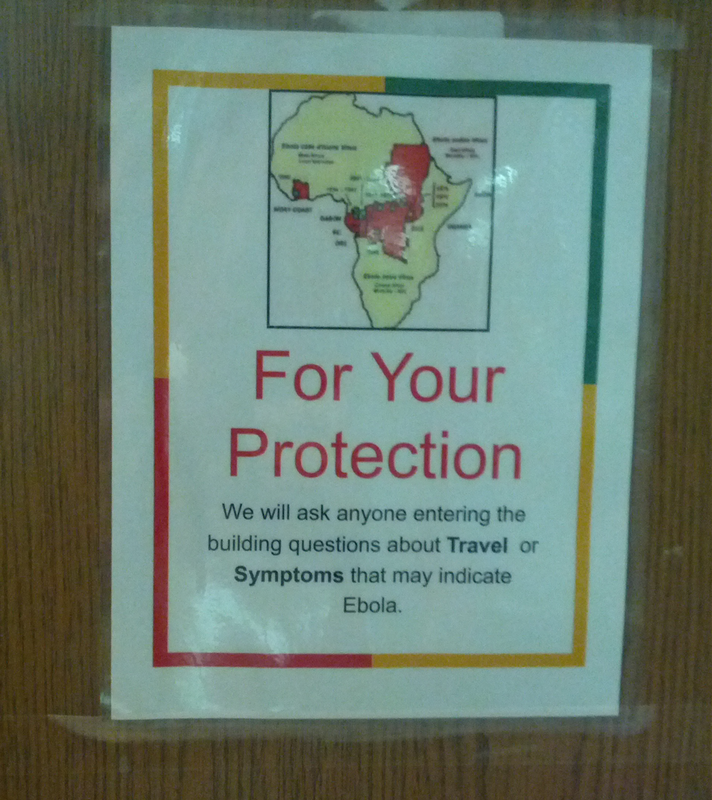 Quarantines have offered somewhat effective means of containing Ebola. Their prevalence as a tool to combat Ebola echoes attempts to contain plague in seventeenth-century Italian cities, when the isolating the afflicted within cordoned city-state or regions as soon as possible fit new understandings of the transmission of disease by individual bodies. Quarantines separated people known to carry the plague, segregated by analogy to goods exposed to plague or disease that remained for periods of forty days [quaranta giorni] in order that miasmatic “pestilential air” could dissipate, and the rapidly growing numbers of those infected with plague be effectively circumscribed. The practice of quarantine emerged before plague hospitals, and the same sort of isolation once again emerged as a coordinated reaction to unidentified virulent diseases such as the recent outbreak of SARS: quarantine managed plague with shifting efficacy from 1347-52, as cities instituted quarantines of neighborhoods or goods in the face of a disease against which there was no known or effective medical response–encouraged or facilitated by the drawing of a fixed spatial boundary on terrestrial maps, as in this late seventeenth-century plan of the barriers that would contain the plague in seventeenth-century Bari. 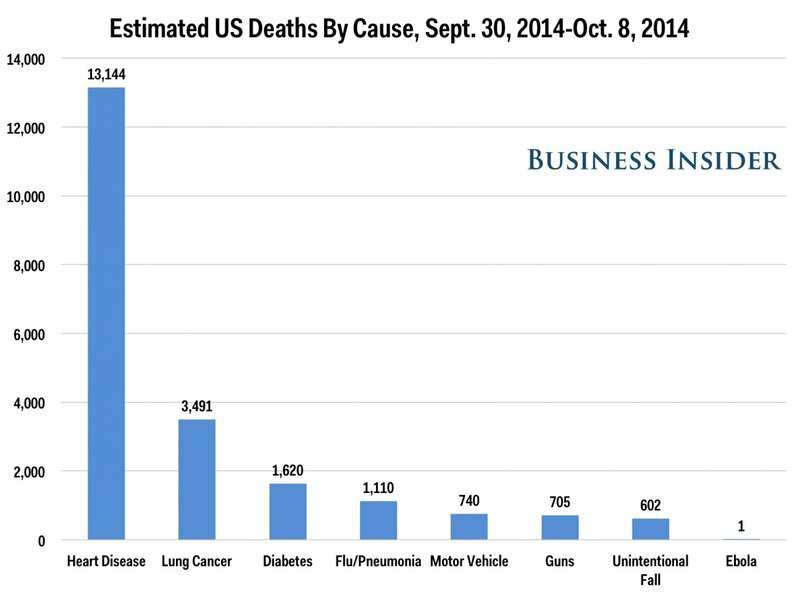 Is this emphasis on the human-to-human transmission of disease the correct strategy to apply to Ebola? The spatial containment of bodies of the infected and ill–who are often asked to lie in isolation wards that are deemed an effective death sentence for those effectively removed from medical care–oddly mirrors early modern reactions to pestilence despite our more effective concepts of tracking disease: although effective if they occurred quickly, the scope of Ebola virus in the region suggests a range of factors have shaped true transmission of a disease beyond close contact with bodily fluids, or its human hosts: are human bodies rightly presumed to be the sole agents in need of containment, and the sole subjects to be confined? Is an emphasis on the danger of human-to-human transmission, the sort of transmission that quarantines seeks to limit, an adequate response? Closed national borders have so far followed the logic of quarantines for those infected with the virus–rather than of controlling the vectors of its transmission. If barriers have contained disease when created quickly, the vectors of Ebola’s transmission are so challenging to map to make analogous quarantines by cordoning off West African regions offer a sort of exemplum of the misleading picture of the pathways of infection that the Ebola virus might exploit. 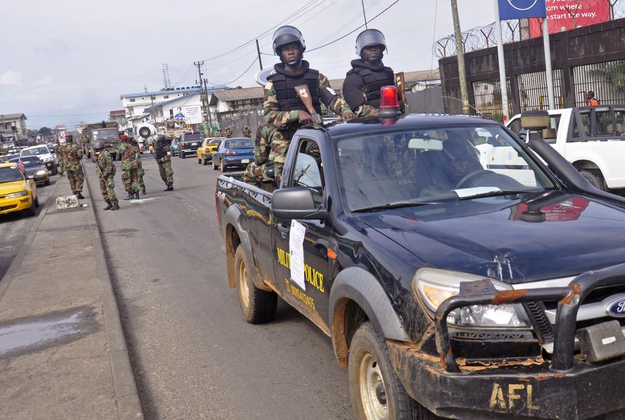 Fifty thousand people were quite recently forcibly barricaded in Monrovia to isolate the Ebola virus’ spread, limiting access of inhabitants to food or drinkable water and no doubt increasing their desperation, fearfulness and sense of fatality. The first two Americans reported to be infected with Ebola virus, Dr. Kent Brantly and Nancy Writebo, have been transported from the continent, and to Atlanta, to recuperate in isolation chambers set up by the CDC in Emory University Hospital, the former recently released after being cured. Is such a dramatic contrast in understandings of the etiology or response to the disease unconscionable? With numbers of those affected by the Ebola virus now seem destined to rise exponentially, with some West African countries experiencing an increase of 50% last week, the specter of further quarantines and fears of the airborne transmission of the virus are misplaced. Although the contact with dead or ill bodies is one clear means of transmission of the disease, its long strands are rooted in the body’s fluids–and its most virulent strain yet encountered seem able to have “jumped” from animal meat to humans, and prove particularly difficult to contain in cases where the disease is advanced. 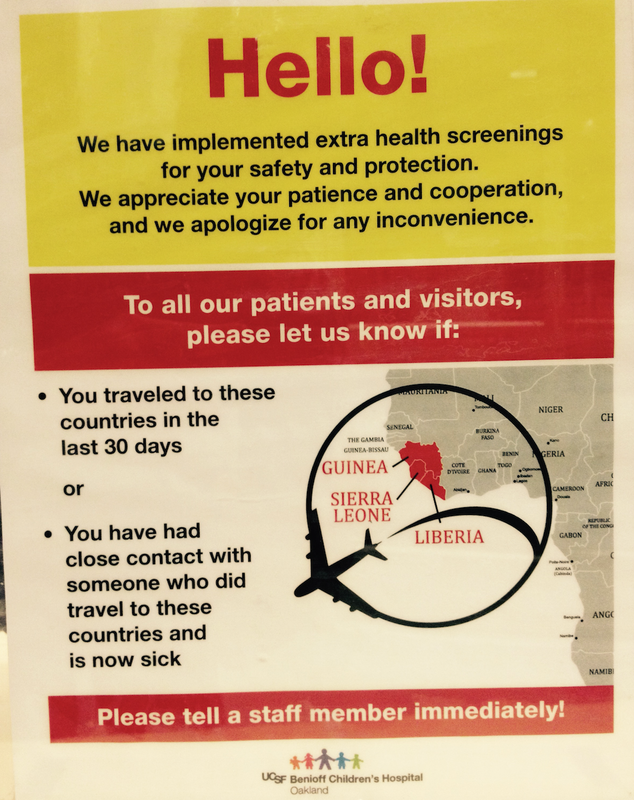 The initial response of the United States Center for Disease Control and Prevention was to issue bulletins restricting non-essential travel to Guinea, Liberia and Sierra Leone, in the hopes to create distance between the US and the re-emergence of the disease. African nations followed suit, terrified by re-emergence of the deadly virus and the lack of any public health response that was deemed effective: Nigerian airlines cancelled flights to Freetown and Monrovia in an attempt to contain human contact with the infected; Nigerians angrily blamed airplanes for allowing passengers infected with Ebola to enter the country as opening the pathways to transmission of the disease. But presumption that victims of Ebola constitute the prime subjects needing to be contained, or quarantined, or that the disease could be bound and frozen, kept within the boundaries of states where the virus, not only hamper coordinating medical reactions to Ebola and needed supplies, as well as food, but offer a no-exit strategy that may fail to contain the disease or address the actual vectors and incubators of its rapid geographical spread through several cities across the central Continent. If trade provides a crucial means for the communication of disease, which is not only particularly aggressive but may mutate in the face of resistance. Rather than being an isolated instance, historian Tom Koch, who has studied the uses of maps to embody the spatial distribution of diseases from the early modern period to the present, warns that “rapid viral and bacterial evolution brought on by globalization and its trade practices” pose deep challenges to how we contain future outbreaks of disease as well as to our practices of medical protocol and ethics. The reactions suggest a terrifying widespread return of medical quarantine as we face increasing fears of contagion as unable to be contained. The need for containment is itself echoed in the mirrors maps manufacture about the disease’s rapid spread, and what better maps might exist in an age when our mapping abilities to track the transmission and probable bearers of the highly infectious virus. 5. The figure of infected victims of Ebola crossing national borders has become a standard and repeated image of the transmission of disease and the challenges of its containment. A widely read report of late July described with considerable panic the arrival in an airplane of a man infected with Ebola who collapsed in the airport of Lagos, Nigeria, infected with the Ebola virus. It provoked increased fears about the very vectors of Ebola’s transmission, including airborne transmission (which is impossible) and exposure to the environments where the bodily fluids of its victims have been present. The communicative value of even the most accurate epidemiological maps of the virus’ rapid outbreak may have failed their readers–as this powerful visualization from National Geographic–in communicating the nature of its transmission, despite its terrifying suggestion of its spread in West Africa serves to emphasize the global threats that Ebola’s spread pose. Although disease maps provide clear tools to understand the spread and pathways of communication of a disease, the highly virulent and rapidly moving nature of the virus, whose spreading transmission has multiplied because of both growing density of urban population sizes and the increasingly interconnected nature of populations in the region. Given the increased health risks that are the result of huge changes in West African urban geography, both the simple tally of cases of Ebola the snapshot-like nature of most distributions by country only skim the surface of the depth of multiple stories–and terrifying fears–about the virus’ rapid spread across the West African coast. For the story of Ebola is increasingly about the new vectors of transmission that result from the relation of the cities to the interior, in ways obscured by data distributions that collectively group numbers of cases and deaths–mutely enumerating the daunting count of those infected and deceased, but without telling a clear story about its geographical spread across a rapidly urbanizing region. The spread of Ebola across four nations since April, when it was first reported to have spread from an epicenter in a rural Guinea, is unprecedented in the relative rarity of its geographic spread and the rapid bodily decline of those it has infected raises questions of how medical supplies, infection control, and treatments can be maintained, across two geographically removed regions–as the existing caseload of Ebola will likely surge in coming weeks. The odd mapping of the incidence of Ebola by nation contrasts with the extent to which the hosts of bats and other animals whose flesh is consumed known as “bush meats”–and not person-to-person contact alone, despite the horrors of hemorrhaging and bleeding in an uncontrolled manner so horrible watch and humiliating to experience. Although such meats are currently prohibited from consumption, the virus’ rapid spread provokes fears of containing increasingly porous boundaries between nations in West Africa, but such containment and isolation may discount other sources of the bearers of disease at multiple sites, or the over two thousand afflicted with Ebola. And, if bats are indeed the hosts of the virus, few mapping of the incidence of bat colonies have been attempted to determine the possibilities or potential for the virus’ geographical spread. 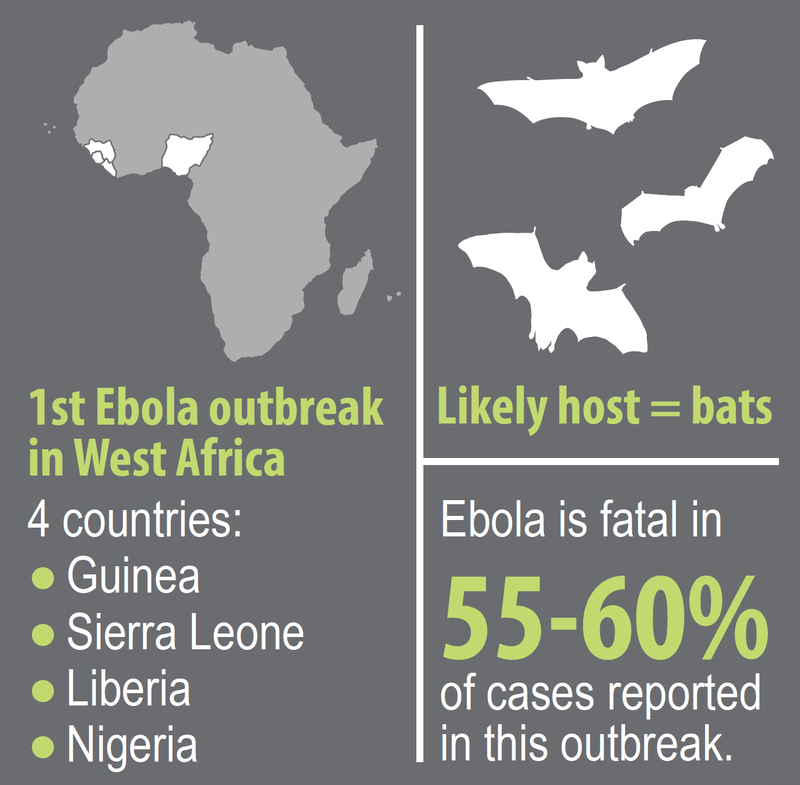 Could one map not only the presence of disease in populations of fruit bats, a common for of bush meat, and the routes of their harvesting and transport for sale to urban markets, as a basis for the spread of the virus from the first perceived epicenter in Guinea to Liberia and Sierra Leone where it has been particularly virulent, as well as Nigeria. Might pathways of the handling and consumption of meats be mapped against the disease? Is the danger of the disease’s fatality underestimated in the graphic posted above? 6. Can we explain the dangers of its communication by maps that do not adequately chart the spread of the virus’ outbreak by a range of vectors? The effort of humanitarian mappers, using OpenStreetMap mapping templates, readily applied mapping techniques to track the first outbreak of infections from April 2014 occasioned an early attempt to trace the spread of the virus from rural areas, and define its Guinean epicenter and routes of travel to coastal towns from the regions around Gueckedou, as Doctors without Borders requested the OpenStreetMap Humanitarian team to map the outbreak in an effort to define with greater precision the spread and immediate impact of the disease, using Bing’s high-res imagery of the region, and maps from Airbus Defense and Space as well as overlaying satellite images with MapBox Streets/Digital Globe to track incidence with a resolution absent altogether from most large-scale maps. The collective effort of 200 mappers to locate over 100,000 buildings and some hundreds of miles of roadways supplemented the absence of adequate maps of the region of Guinea, the site of the first hemorrhaging confirmed caused by Ebola virus. 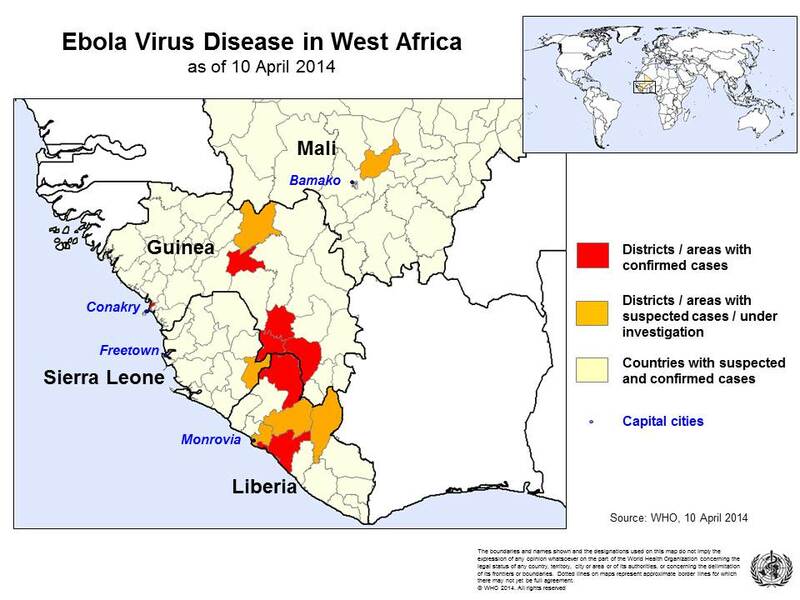 At the same time as worries already began of the spread of the virus to Liberia and Sierra Leone, the mapping helped establish the epicenter in Guinea and radius of the outbreak. Despite the far greater complexity and geographic range of Ebola’s spread, such maps might be beneficially integrated with other overlays in attempts to try to understand the mechanisms of its rapid spread in an area for which we often lack adequate maps. The level of local detail in such early maps already pinpointed the breadth of its transmission, and raises questions about the role of human-to-human transmission as the sole vector of the virus, which has been argued by the World Health Organization in July to have been transmitted by wild animals, such as bats, but in addition to bush meats from wild animals, in the local pig farms that often play hosts to the bats. 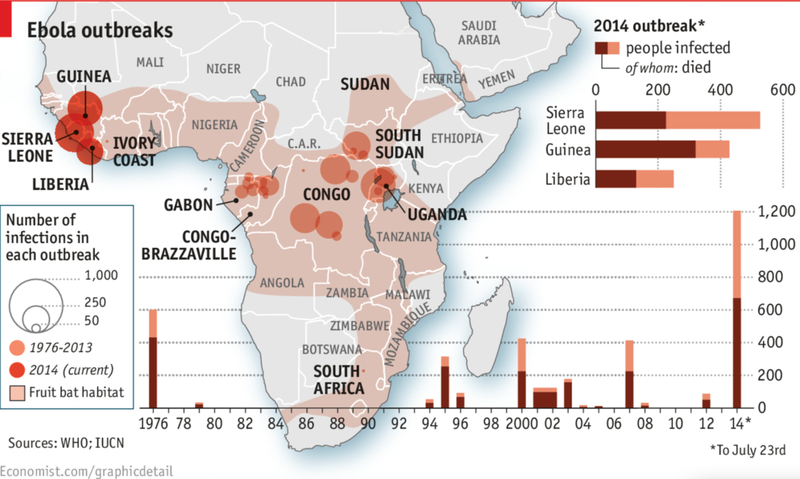 The spread of Ebola in West Africa in relation to “Historical Cases” magnify its danger, but oddly contain the virus to the African continent’s sub-Saharan regions. 7. The mapping of “historical cases” of related Ebola virus outbreaks may introduce more than a bit of a red herring. For although they similarly seem to have begun from similar reservoirs of monkey or bat hosts, relations between the viruses is not clearly understood, despite similarities between the Guinea virus and the Zaire Ebola virus (EBOV) lineage; nor are links between their different reservoir species or hosts and the virus outbreaks understood, although the relations are presumed in the coloration of the above inset map of the African continent. The vectors of viral transmission may create a map quite distinct from the earlier inland growth of Ebola in both Central and South Africa. For outbreaks of Ebola may have all been incubated first within the animal populations in ways not communicated in the above maps. At the same time, the natural cycle of transmission of Ebola within the forest remains largely unknown, creating problems understanding its transmission–although its appearance in and transmission from animal populations has been clearly identified as the basis for its spread at the forest’s edge in rural Guinea. 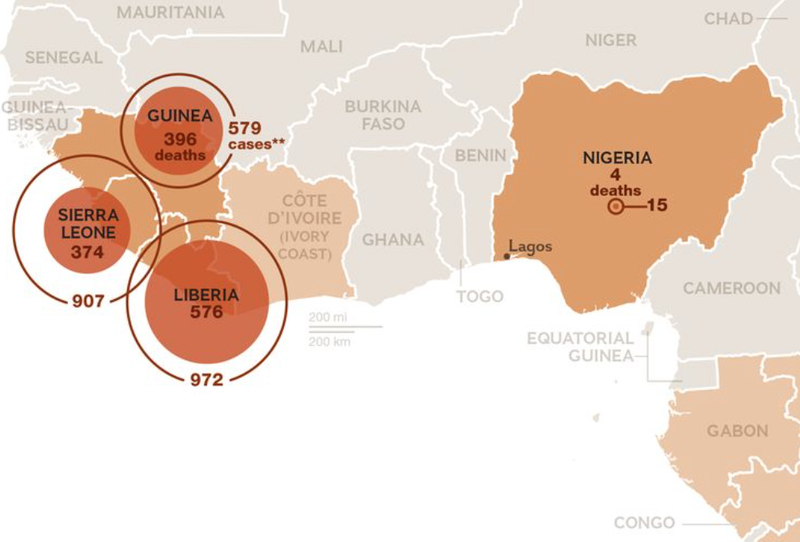 The spread of the virus across three countries by late July already made it the deadliest breakout of the contagious virus in the continent as it moved from Guinea to other edges of the forested interior, in ways that the CDC map below does not clearly describe, but explain the odd dispersion of cases reported around the border between Guinea and Sierra Leone. 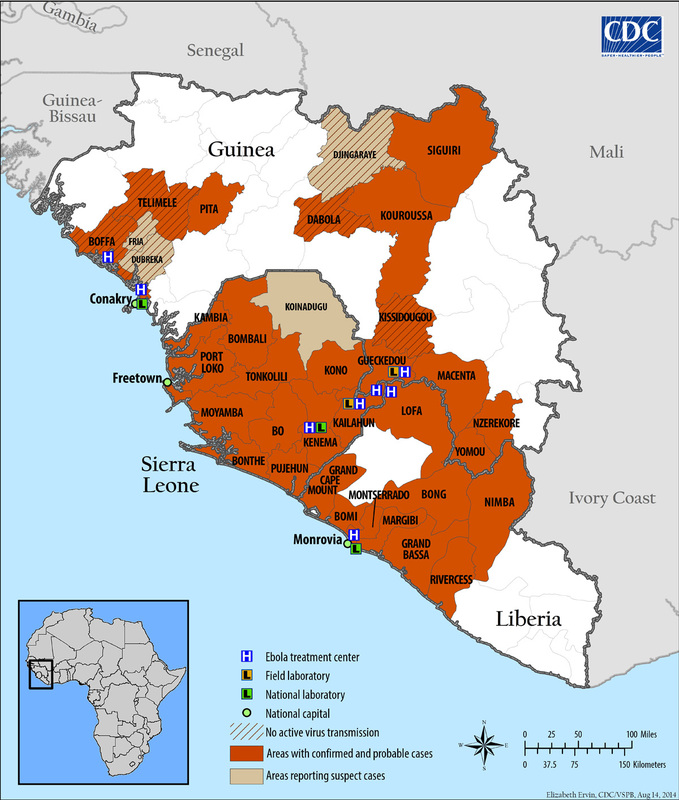 When Liberia shut most of its border points in late July in an effort to contain the disease and halt the virus, it had already spread across at least four nations, leaving possibilities of its future containment optimistic at best, in an attempt to isolate the migration of infected individuals given deep preoccupations at continued geographic mobility in the region. The confines created around those districts with suspected or confirmed cases in April, shortly after the spread of the deadly virus had been mapped, misleadingly places the problems of quarantine on each nation–Mali; Guinea; Sierra Leone; Liberia–and not to define the impact of infections on local society or analyze the channels of its transmission, apparently able to have jumped national boundaries with ease in areas. We perform a far less sophisticated mode of mapping outbreaks by identifying its incidence in isolated districts, without the greater geographic or spatial specificity the OSM map tried to chart–and perhaps have provided a misleading map that raises false hopes for being a ground-plan to its spatial or geographic containment. But the multiplication of incidence has of course made the process of mapping impossible, and fears of under-reporting widespread. Such a mapping might be particularly important, however, since the evidence suggests that the combination of increasing human penetration into rain forests, and increased human contact with meats in urban centers–in addition, most significantly, geographical mobility between goods from rainforest areas to growing urban slums, creating channels and microclimates that are increasingly likely to change the patterns of the transmission of Ebola in ways maps might better track in order that the virus could be more effectively contained. In an era when satellite-based mapping and GIS systems could make questions of human penetration into forests, contact with animals, distribution of bats and other species, and population density in urban slums where Ebola has spread could stand to be mapped in quite potentially significant epidemiological ways. The recent growth of populations in West Africa that are living in urban slums from the Ivory Coast to Senegal suggest an especially dangerous topography for Ebola’s growth, which is left silent or unspoken in most infographics of the region, despite its significance in understanding the social shifts that magnify the transmission of the deadly virus. 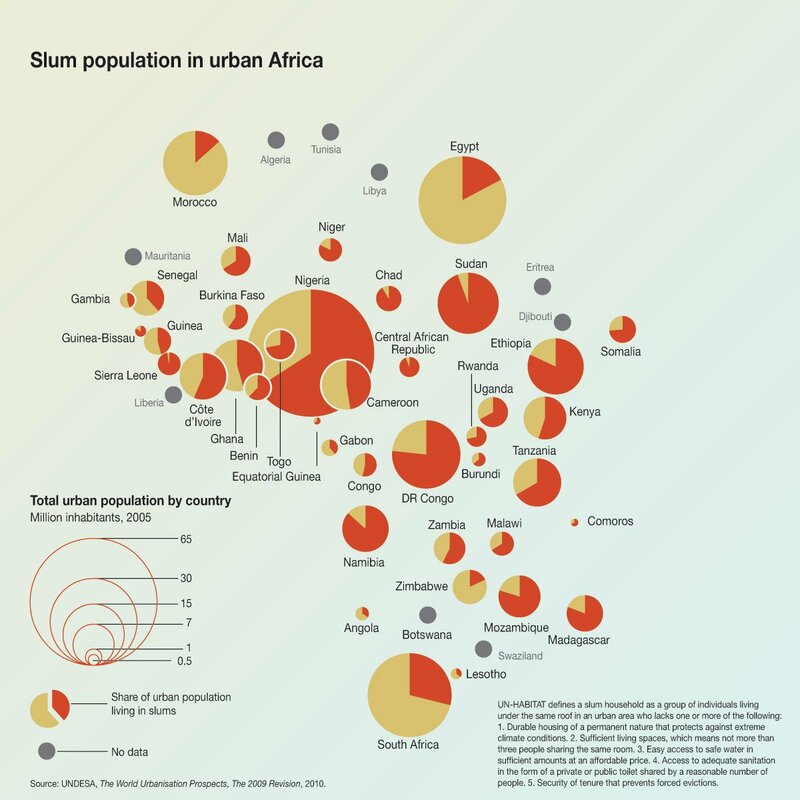 The considerable growth in urban areas and slums in Conakry, Bamako, and Dakar make them terrifying incubators for human hosts, again absent from infographics of Ebola’s current spread. The distinctions of local distributions are unfortunately erased in flat “impact maps” which highlight danger zones of travel, and not effectively map the virus’ transmission and spread or the environments in which it has grown–the flat colors of data maps, prepared relatively quickly with whatever data is at hand about Ebola, and not the region, seem almost to hide, rather than try to foreground, the dangers of the virus’ spread and the dangers of its migration from rural to urban areas. If in 1990 there were only some 24 cities in Africa whose population exceeded one million, the number of cities with more than a million inhabitants had doubled by 2011, and has exceeded that proportion by 2014, and many of these urban agglomerations are concentrated in West Africa in ways that have dramatically shifted the landscapes across which Ebola has so far most intensely spread. The movement of the virus to these cities was terrifyingly close in April, when it seemed inevitable, or evident, but few measures of adequate containment were articulated or in place as the virus advanced from Guinea to Mali and Liberia. 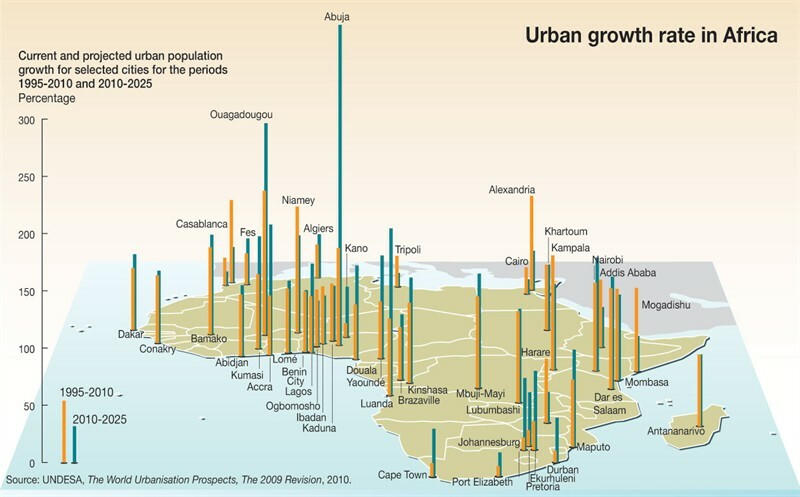 But the shifts of urbanization that have occurred in the region were oddly absent in most of the maps that describe the disease’s spread in districts of Guinea, Sierra Leone, Liberia, and Mali–the size of urban populations only become prominently realized in maps of contagion after the virus arrived in Dakar. 8. Boundaries between states however provide a limited information to allow us to track the disease’s spread or its scope. The responses to the spread of highly infectious virus by August was to shut the borders crossings and frontiers between nations, in a terrifyingly shortsighted miscalculation of the spatial geography of viral containment, and misplaced allocation of resources, since the virus had already spread to Guinea. When Liberia shut most of its border points in order to contain the virus’ progress to the south, was the area of infection from Gueckedou already too progressed to rely on national frontiers as a basis to staunch its spread? Were other possible causes or vectors of disease less addressed? While the map rightfully suggests the importance of human-to-human transmission, it oddly omits the very animal populations that both suffer from the disease and from whom Ebola is prone or apt to jump. Closed national borders follows the logic of quarantines for those infected with the virus–rather than of controlling the vectors of its transmission. Continued consumption of bush meats across much of West Africa suggests a far likely route for the transmission of Ebola than person-to person contact. The difficulties of preventing the consumption of bush meats that were infected with the disease–including fruit bats, rats and monkeys–though widely suspected to be as the chief bridge between humans and animals in the region. The transmission of disease in meats–either uncooked or by butchery–can cause itself multiple centers for the transmission of the disease from infected humans, not tracked by the concentration on human incubators of the disease. Despite the current ban on consuming bush meats, the possibilities of such a transfer of the virus through consumption poses a decisively high risk and is potentially difficult to enforce. Many villagers openly blame the arrival of medical teams for the virus’ spread, even as fruit bats and antelopes and rats have disappeared from the markets of the main towns, attempts at curbing the consumption of animals that are both plentiful in the forests and provide a prime staple to meet local nutritional needs of urban and rural poor in an area without animal husbandry; such curbs on the butchery and sale of bush meats are however most often met with incredulity among many–“Banning bush meat means a new way of life, which is unrealistic”–in regions without animal husbandry, and the eating of potentially uncooked meats or handling of dead infected animals from the forests effectively multiply the potential for further human-to-human transmission of the disease. 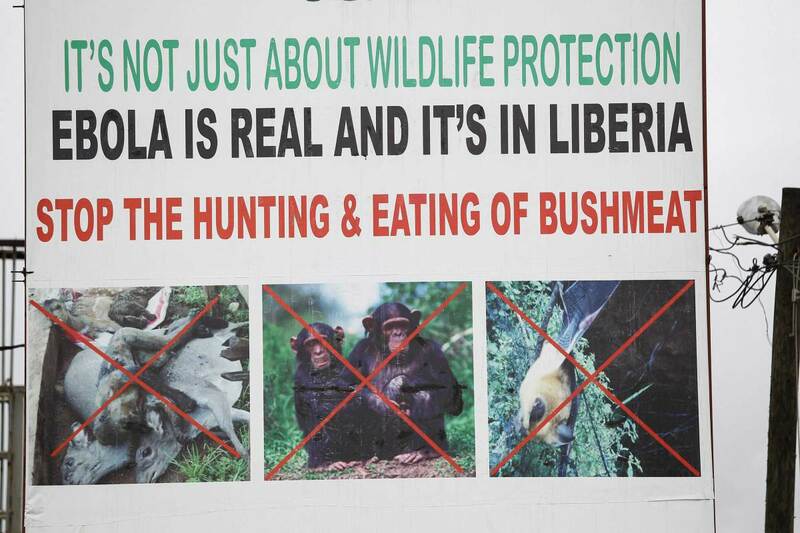 A ban on consuming bush meats–Liberia forbade its consumption and shopkeepers selling bus meats were jailed in attempts to retract its consumption in Nigeria–was less effective in practice, and pushed trade underground. Bans on the importation of bush meats into London reveals fears of the meats as vectors of transmission that are difficult to control in West Africa, but have gained less attention than they deserve. 9. The policy seems to hope to contain the spread of bodily fluids that are associated with its transmission from those inhabitants infected with Ebola, as if the enforcement of clear boundaries could prevent future transmission in an era when far great border-crossing and dramatically increased interconnectedness of urban populations across West Africa. 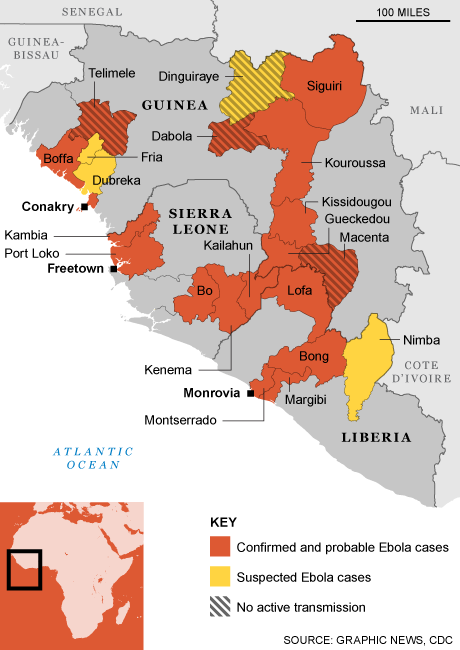 Indeed, the mapping of the epicenter of its “outbreak” seem to be beyond the point, if important to register, in dealing with its spread: the unwarranted closing confines with Sierra Leone and Liberia rests on the conception that human-to-human transmission constitutes the sole or primary sources of its incubation. But this inference may be false, according to Mapping the Zoonotic niche of Ebola virus disease in Africa, who suggest that the transmission from infected humans is in fact surprisingly low. The absence of attention of a topography of the network of transmission of the disease, and of the presence in animals, as well as humans, would offer a far more complete picture of its transmission beyond the numeric tabulation of the dead in datasets. What could a more dynamic terrestrial mapping of the spread of disease show, beyond the fears for its further expansion? In what ways does the embodiment of the virus’ spread in maps of the districts of West African nations poorly communicate the nature of its spread–or the relations between Ebola virus’ spread and recently increased connections between large urban centers on the coasts to rainforest areas previously less often penetrated by purveyors of goods for urban food markets. Indeed, health authorities would do well to monitor then expanded unrestricted or reviewed traffic of foodstuffs and plants from vendors who move with increased access to the deforested rainforest areas on new roads into growing cities, even if the virus is already out of the bag: for the very roads linking regions that were previously with far less contact with one another create new pathways for rapid transmission of the virus, as much as they might be seen as forms of regional modernization. 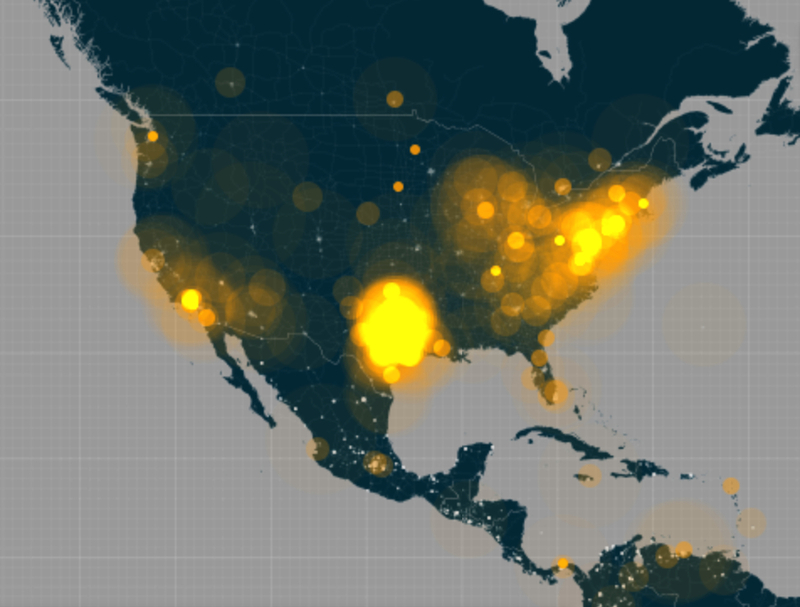 Despite the good intent to emphasize the global nature of the epidemic, the graphic removes attention from the on-the-ground story that the same magazine had been tracking so compellingly. For all the knowing ways of getting the attention of readers of a progressive magazine, the image of the proliferation of Ebola on airplane flights may even minimize the questions of either its spread on the ground or provoke a rhetoric of quarantine. 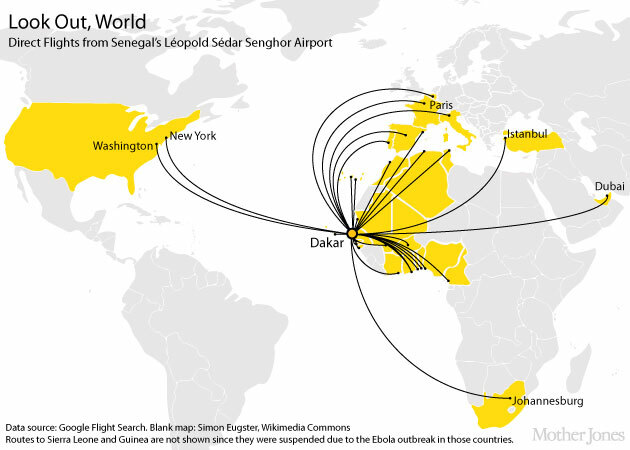 The map of airplane flights from Senegal’s capital does suggest the huge changes in human connectivity that have emerged in the past decade, as if they stand to change the transmission of the deadly virus into a focus of global attention. 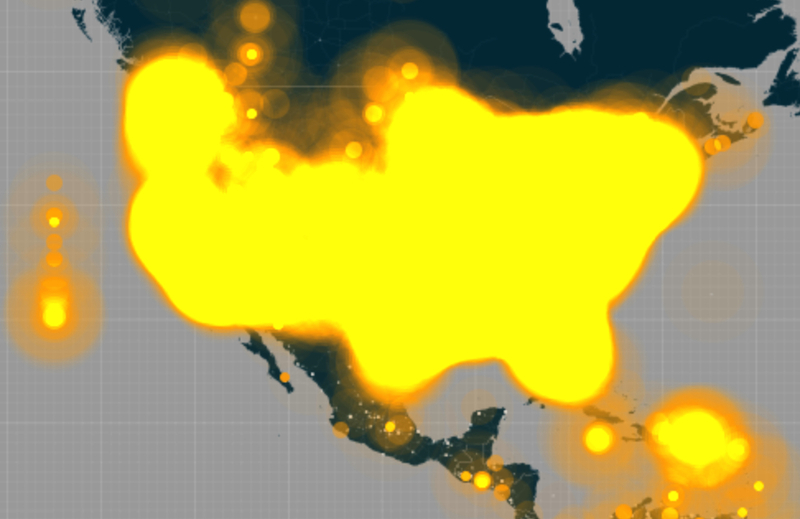 But the alarmist tenor of the map, which colors potentially affected countries in yellow as if to display how much of the globe could be touched by the bodily fluids from infected passengers leaving Dakar, suggests only potential channels of travel–and is not in facet based on actual reporting of disease. 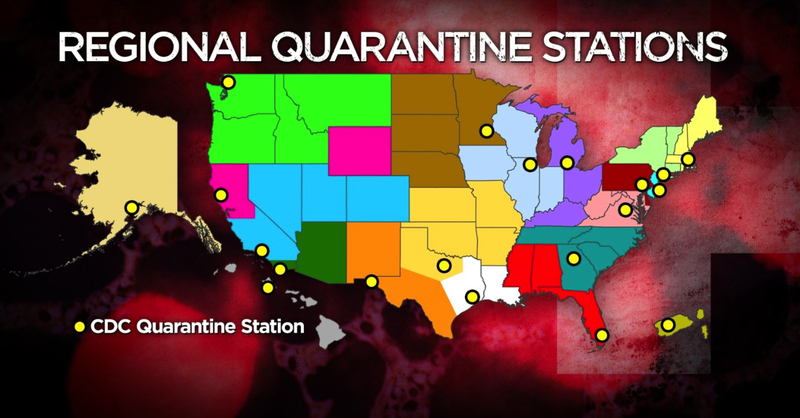 The map almost seems to advocate the need to pursue a logic of quarantine and containment, so terrifying is the scenario of the virus’ potential spread. 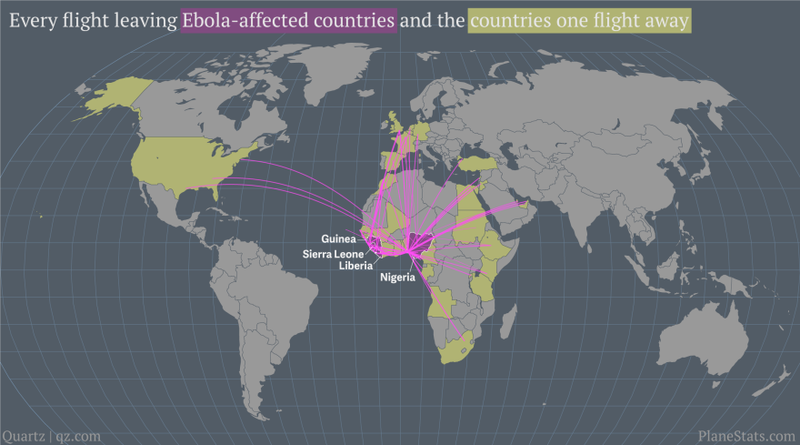 Do the flight pathways tracked by Google Flight Search map potentially expanding pathways of Ebola virus’ communication in ways that play upon our fears, and, even as they ostensibly invite us to consider how the disease might be contained, deflect questions from situation on the ground that we are all too likely to see as if it is far removed? Or are we already there, given the recent mapping of 140 alerts for the hemorrhagic virus that are already evident worldwide on HealthMap? In the case of West Africa, might it be prudent, as Pigott, Golding et al. suggest, to monitor the presence of disease in fruit bat populations and Great Ape populations to try to contain the outbreak of a disease whose outbreak is commonly associated with hunting and butchering, as much as contact with infected humans’ bodily fluids? Despite the risks of contagion from the fluids of the dead, the mapping of diseased populations is often the most fearsome–and least preventative–means to track Ebola’s incubation and chart the virus’ spread. 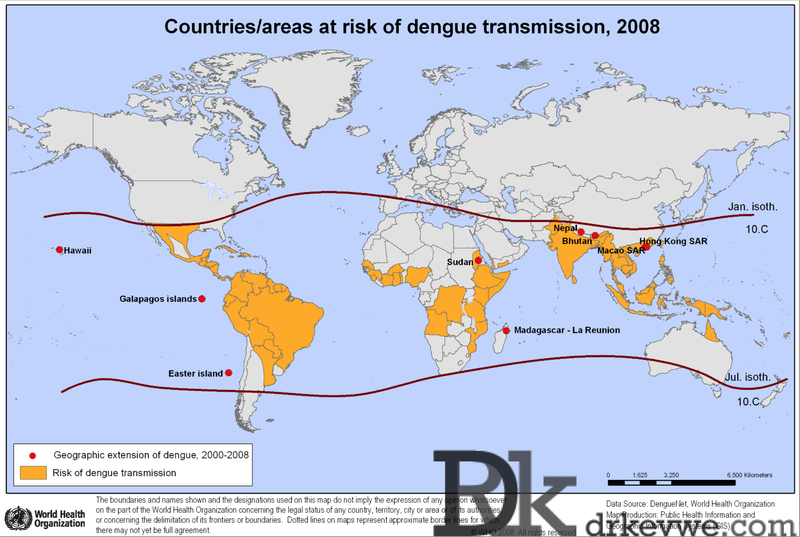 Do such maps effectively perpetuate ungrounded fears of human-to-human transmission by regarding infected local inhabitants to be exclusive vehicles of contagion, since they are the subjects whose mapped distribution minimize the attention we might pay to the transmission of the disease by animals and especially rodents, monkeys, pigs, and widely ranging populations of fruit bats? Rather than being a purely human-borne disease, despite the huge multiplication of human-to-human transmission, the transmission of Ebola through animals, uncooked bush meats, including apes, fruit bats, rats, porcupines, and non-human vectors has dramatically grown since from August. The geographic spread of the virus did not follow regions that were geographically contiguous, but spread from multiple epicenters in the region, in ways perhaps dependent on animal hosts and the possible cross-species jumping of the disease from bats to apes and others. 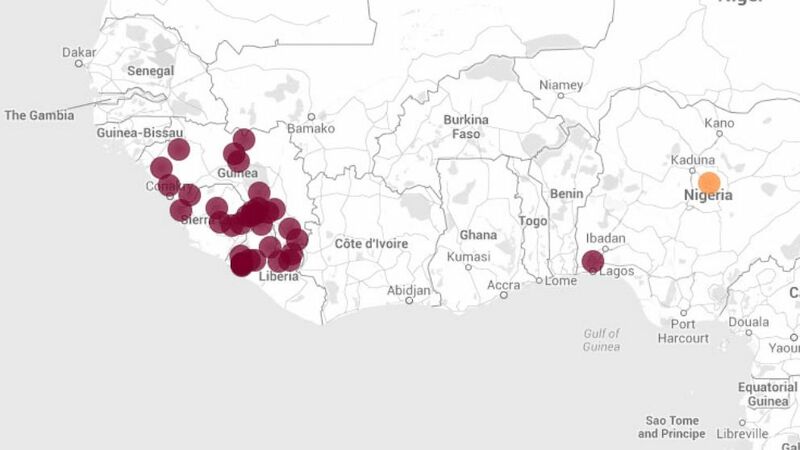 The maps of local health authorities and treatment centers against the spread of reported instances of Ebola offer images of overwhelmed health institutions which surrounded by the virus’ spread, hampered from reaching inland areas affected: major treatment centers in the region appear to be swallowed in a sea of Ebola infections, themselves overwhelmed by risks of infection they are inadequate to handle. They exploit justified fear of the virus as a source of infection by displaying the paucity of hospitals field laboratories to study to the incubators of the virus’ spread or be trusted to staunch it, as well as the deep need for international aid to contain the further spread of the virus and care for its victims. The map charts the spread of a disease as overwhelming medical capacities which are positioned in a far smaller area than the areas where confirmed case of Ebola have been reported. Its design of placing the few clusters of treatment centers far removed from the expanse of afflicted almost confirms the decreased trust between healers and patients for a virus which not only lacks commensurate medical response: treatment centers seem lacking in ways that could stave off the dangers of the virus’ inland spread. The authoritarian images of control over cities by armed forces, or militias that fumigate streets or men in white HazMat suits, recuperating the body of the dead that were formerly attended by family, suggest an imagery of antibiotics and antiviral spray in Monrovia’s Duwala marketplace, as if to acknowledge the fatalism of the virus’ spread and the only means of stopping it with antibiotics and law and order–notwithstanding the huge potential risks of panic. (Indeed, the huge risks of decreased harvests and local food supplies, whose prices are poised to spike to levels never seen in West Africa, have already led the UN and FAO to secure and transport masses of foods from rice to maize and cassava. Even the recent ban on consuming bush meat may further dry up other needed sources of nutrition.) The promise for the arrival of American soldiers and military–while a needed reinforcement of personnel–cannot but raise fears and questions about the future multiplication of vectors of transmission of the disease, and of their arrival without coordination of the application of best resources to policy of containment. The BBC’s info graphic illustrates the intensity and increased risks that the current outbreak of Ebola poses. 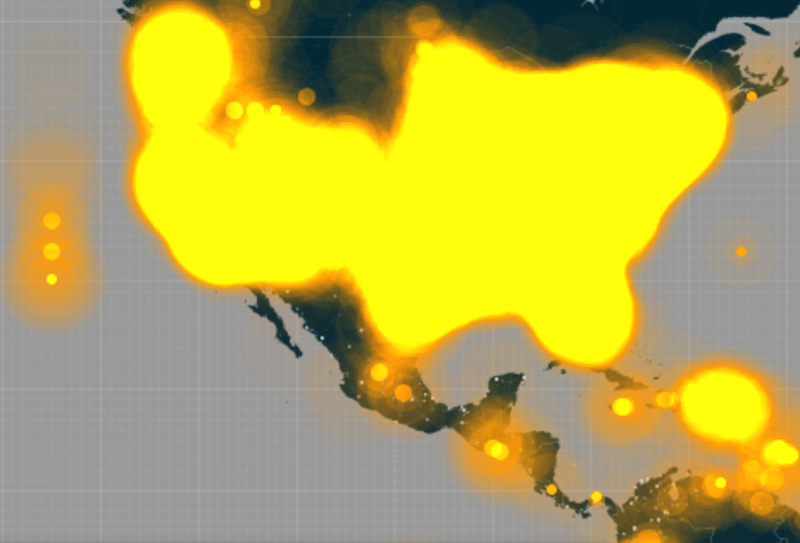 But in projecting the data onto a relatively blank base map, it oddly removes attention from the situation on the ground that it fails to map sufficient detail. The reluctance to encode further information than that disseminated by WHO and CDC creates a limited view of the transmission of Ebola on the ground, despite the impressive use of intense coloring to focus our attention on the expanse of its recent outbreak. 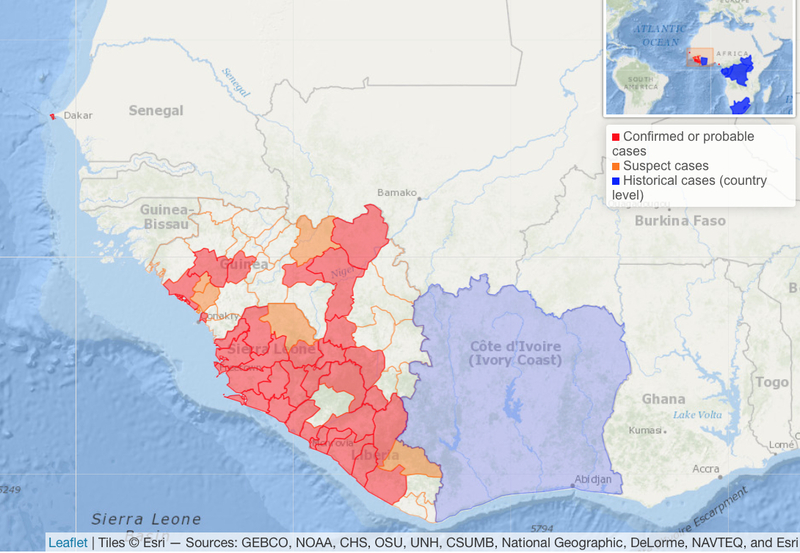 Despite data from such apparently reliable sources as the WHO and CDC, the map offers few guides for reading its mapping the incidence of outbreaks of and fatalities of Ebola virus by proportional nested circles, and presumes that the variants are Ebola are not different from each other, although it does suggest a broadly focussed geographic incidence in a similar region–and apparently similar ecosystems, putting aside the outlying outbreak in South Africa. The absence of individual or collective narratives that it tells leaves one confronting the sheer numbers of the outbreaks, but hanging in the air. Might the mute order of the data distribution be more helpfully placed in overlap with other data, in order to foreground its relation to other potential causes of these viral outbreaks? Even less helpful, of course, are the maps that redden the entire central band of the continent as a source of infectious viral disease. 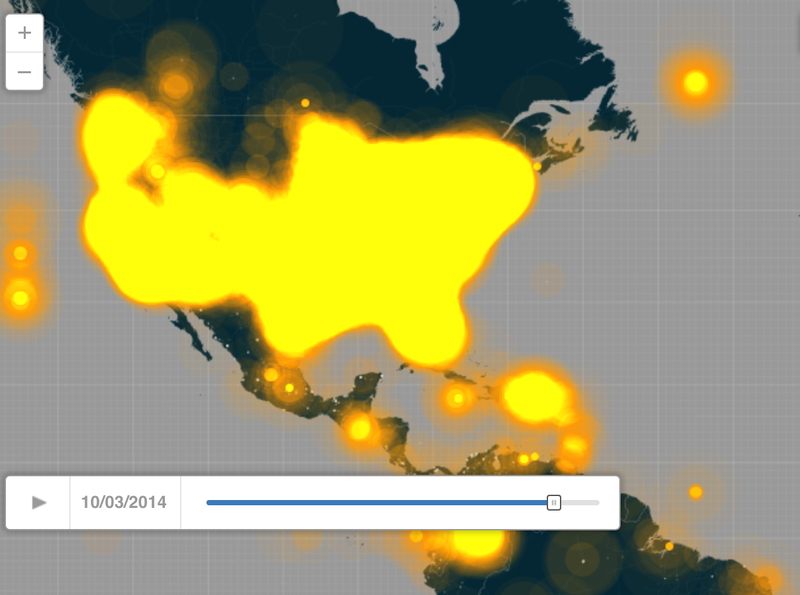 The maps that are proliferating online and in the news tell us little of epidemiological value about Ebola virus’ spread, so much as they reveal the chance of infecting the entire continent, reminding viewers of the multiple sites of the outbreak and recent spread of the virus across the expanse of much of the central continent in alarmist fashion, as if to suggest the danger of neglecting the disease that had previously dedicated the Ivory Coast and CAR. To be sure, the detailed country by country regional spread of the illness suggests the benefits and needs of clearer tracking, and a unique topography for the pathways viral transmission has so far taken, raising multiple questions about the relation between human and animal vectors that encouraged the unique topography within which it has most rapidly spread, but also the distinct topography among reported victims of the disease. Are these counts accurate, one wonders–do they rely on accurate door-to-door screening to tabulate the numbers of those afflicted by Ebola-like illnesses, or depend on the counts of health authorities and hospitals?–and can they forecast its future spread? When the World Health Organization is now predicting some over 20,000 cases of a disease that has no known cure, the limited areas of exposure seem reassuring, but the map of confirmed cases offer little sense of a road-map to its future cure–even if they misleadingly suggested areas of its containment last July. 11. 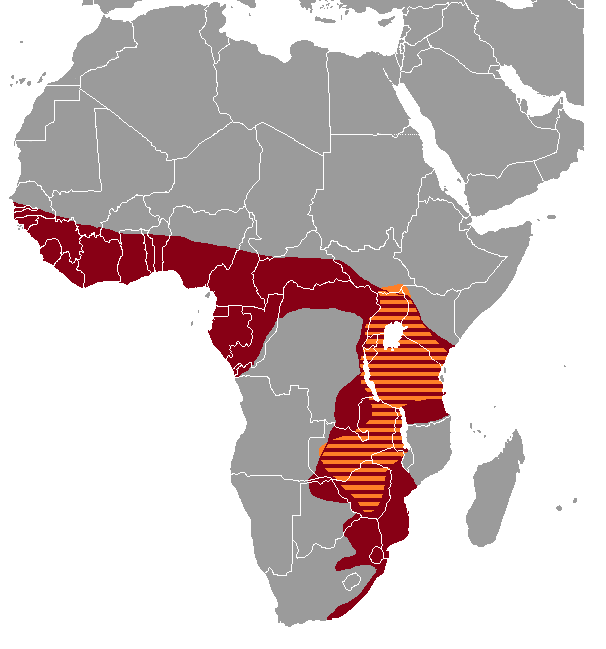 The difficulty of establishing a clean dataset on the ground in these regions is, in a sense, compounded by the exclusive mapping of human cases of the transmission of the disease–which has, at the same time as displaying particular virulence in humans, been widely reported across populations of great apes across Africa–including the gorilla and chimpanzee–to an extent which has so far not been mapped or not mapped with nearly the same prominence as human cases and deaths. Hunting and handling of bush meats appear the most likely causes of outbreaks of the virus, although the dangers of human-to-human transmission are particularly high risk during home care and funerary preparation of infected cadavers. At the same time, they discount the extent to which the increased urbanization of West Africa–and its own expansive rise of urban populations–create a human density where the disease might be difficult or impossible to contain, and the vectors of its transmission uncontrollably spread. Reading the map, one imagines its spread was a public health crisis reveals the poor quality of public health in Africa, rather than that most western medicine has been particularly ill-equipped to understand the spread or the vectors of its disease. 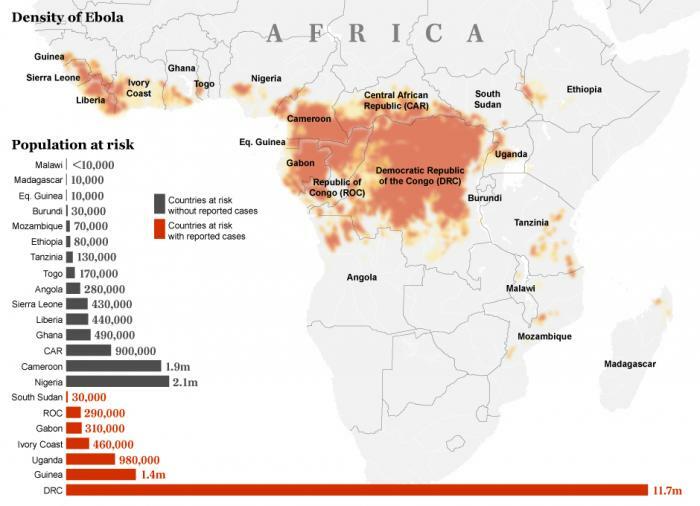 But the map oddly conceals the different viruses of Ebola that have appeared in the past fifty years in Africa, and the increased virulence of the current disease. For although the incidence of Ebola in the Central African Republic now seem to be confirmed as a separate, less virulent strain, the overlap in the map of incidence and the bat population suggest the danger that infected animals transmit the disease in ways not constrained by human-to-human contact. Meanwhile, the map omits the routes of the transmission of the butchery and migration of uncooked meats to cities and slums on rainforest-to-city roads that seem to be a major route for the disease’s transmission. The difficulties of reaching rural areas where the dependence on bush meats is particularly intense–and distrust of foreign doctors or medicine has the potential to be considerably stronger–might create a distinct map that foreign aid organizations might approach the growing epidemic. Local insistence against the danger of consuming bush meats that might be uncooked or handling raw meats and widespread refusal to accept the interpretations of medical aid workers in much of the continent poses a serious health risk–and underscore the importance of confronting this resistance in providing aid to West Africa. The reasons why a base-map of the habitat of infected fruit bats and bush meat consumption have been less prominent in the mapping of the outbreak suggests the limits of relying on base-maps to understand the spread of the disease. 12. The recent dependence on the recycling of existing geographic and news maps of West Africa have been less informative of the vectors of transmission or incubation of the deadly virus. They almost indeed seem to generate the illusion we are able to locate and control the disease whose spread we are still at such pains to try to control by effective quarantine–the three-day country-wide “lockdown” that is proposed in Sierra Leone suggest a desperation at confronting the disease, with the rationale of taking an updated count of mortality rates and number of those afflicted, and may well provoke a deeper erosion of trust between the sick and health-care providers, that would encourage many to disguise the symptoms of illness or not seek out care, at the very time that a better understanding of the basis for its spread need to be understood. Despite the intentionally misleading opinion of the Nigerian government asserted that the haemorrhagic disease in question was in fact not Ebola virus, but Dengue–though this has few grounds for being true–provided an interesting distribution of this insect-transmitted disease across specific latitudinal parameters might lead us to re-dimension our own ways of mapping Ebola against a variety of base-maps, perhaps focussing less exclusively on human victims–even as we mourn their tragic deaths, and see such deaths as a barometer of the global catastrophe of the virus’ spread–by shifting from the counting of the dead that Ebola has claimed than the animal vectors which communicate the deadly virus, or the changes in human populations from urban population density that have increased the transport of meats and butcher shops that have made it more likely for people to come into contact with the deadly virus.